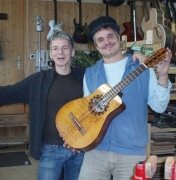 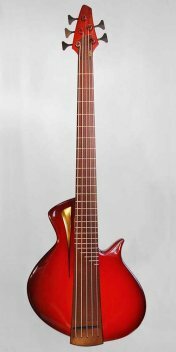 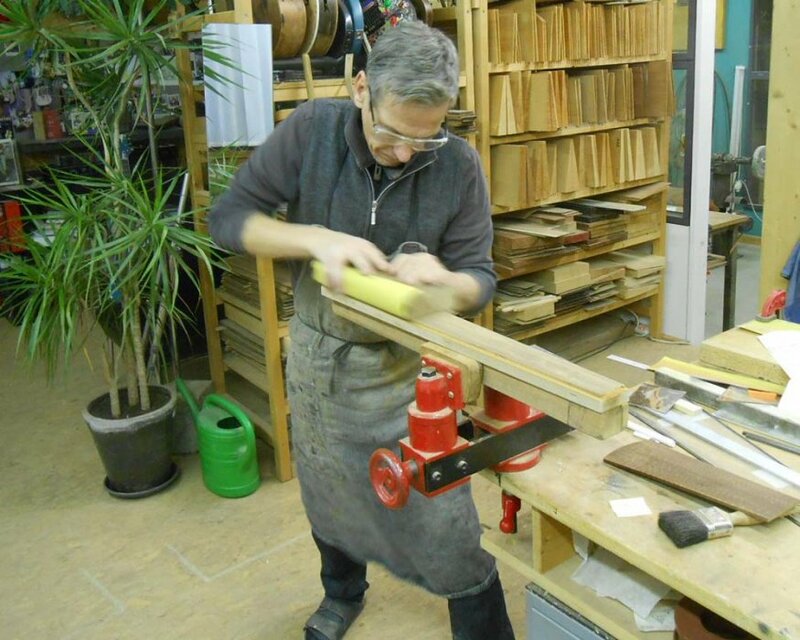 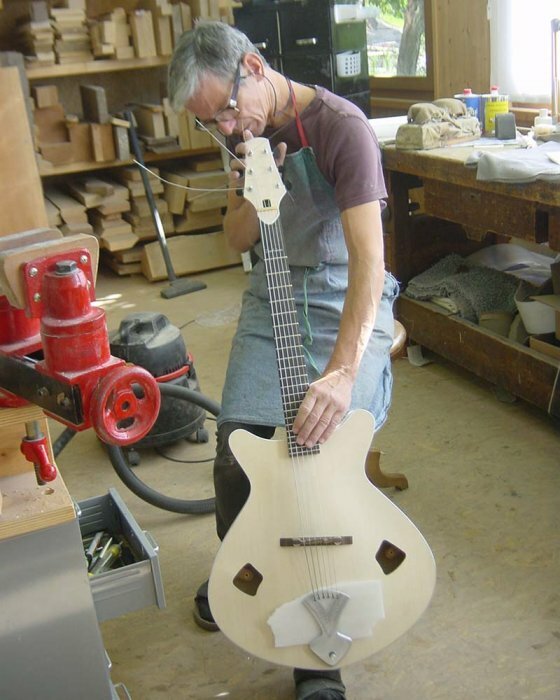 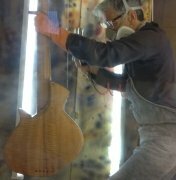 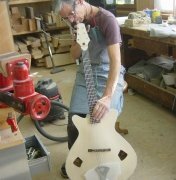 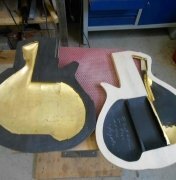 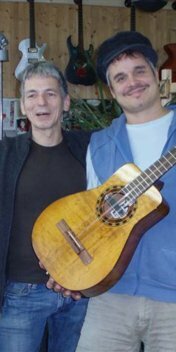 Scott wanted a lightweight bass with an acoustic sound and a continuous fingerboard, like the one on our «Golden Fretless Bass». 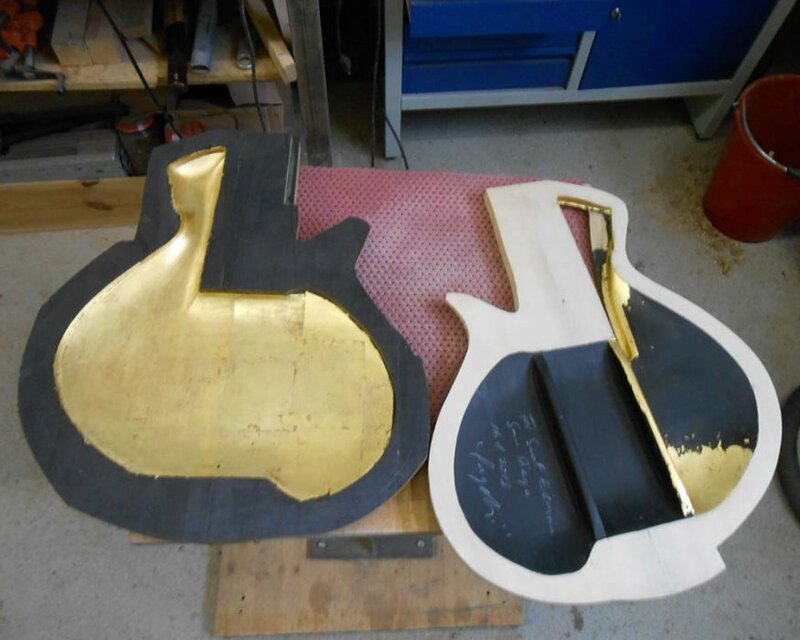 He was also fond of the fact that the Golden bass had no visible pickups or controls. 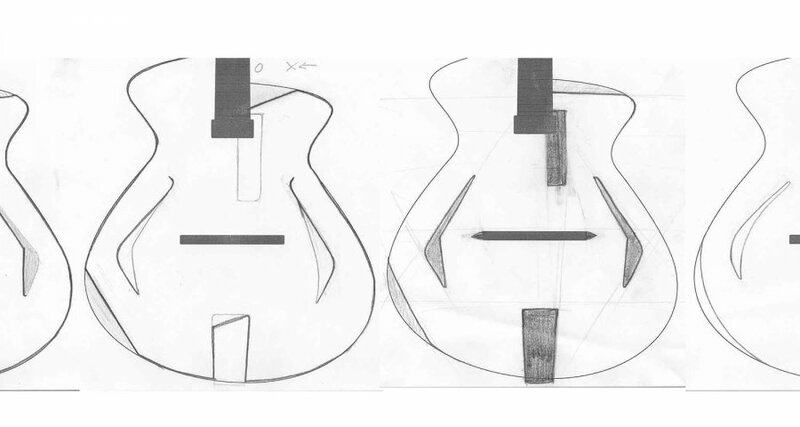 In addition, he also specified that the body should be a single-cutaway design. 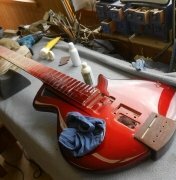 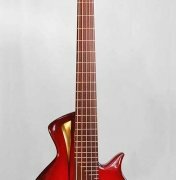 We ended up building the bass using beautifully flamed mahogany for the body, Swiss Alpine spruce for the top, and snakewood for the fingerboard. 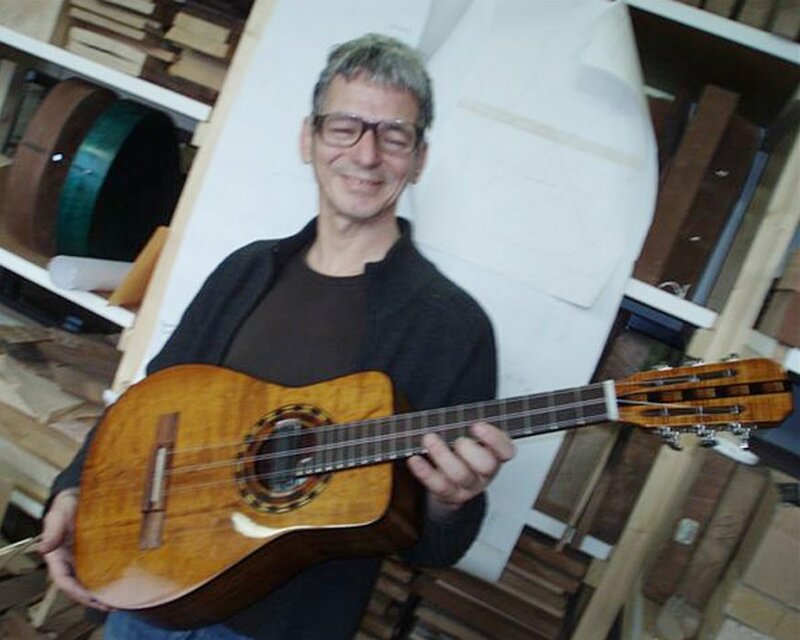 The instrument’s electronics were specially developed by Swiss acoustic amplification genius Stephan Schertler. 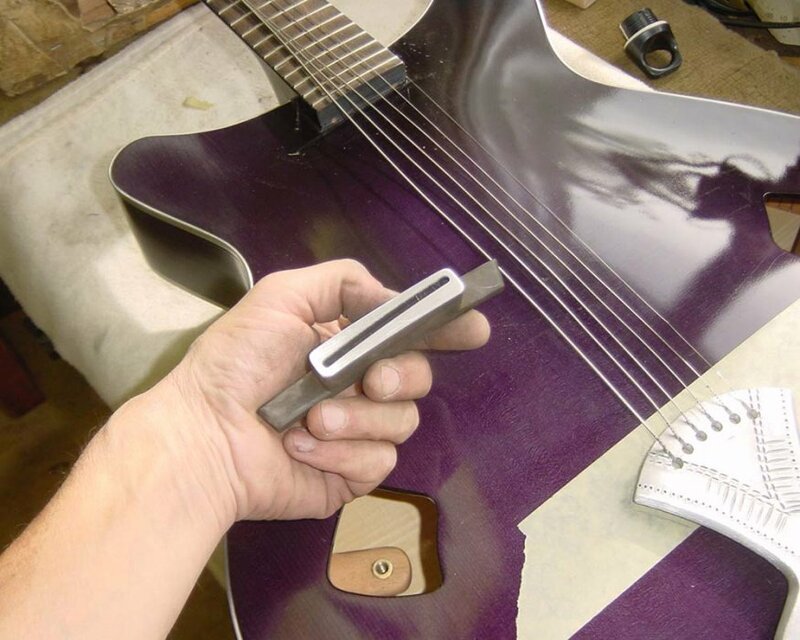 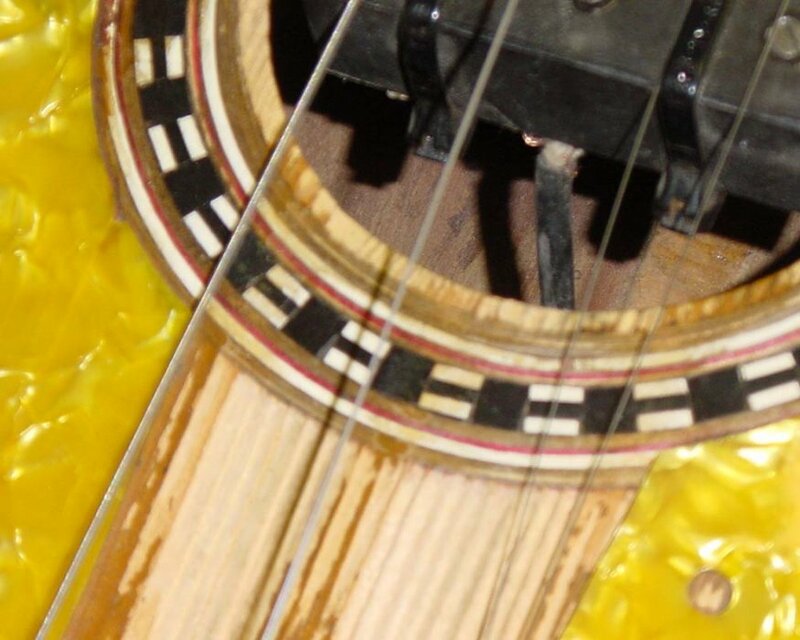 Mounted underneath the fingerboard (a section of which is removable, and held in place using magnets), the pickups are completely hidden from view. 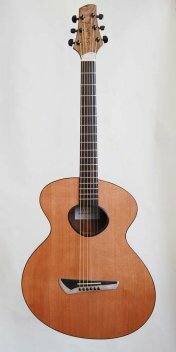 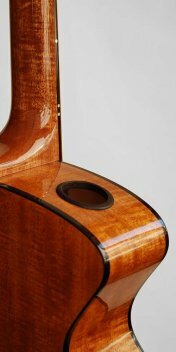 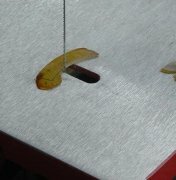 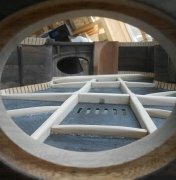 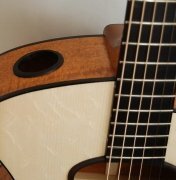 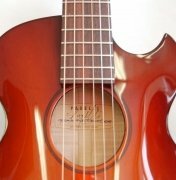 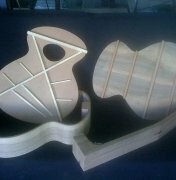 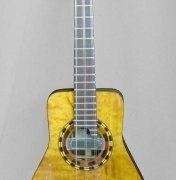 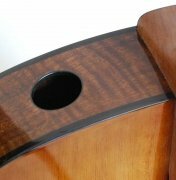 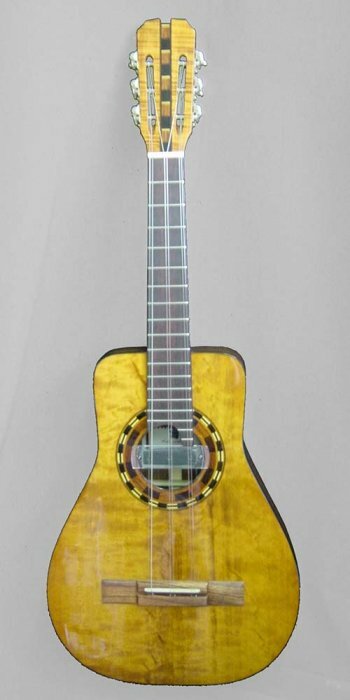 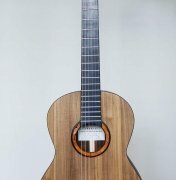 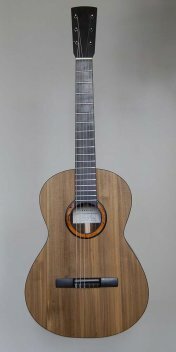 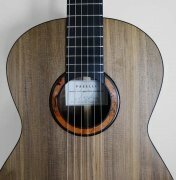 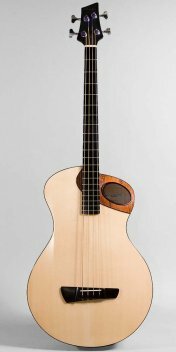 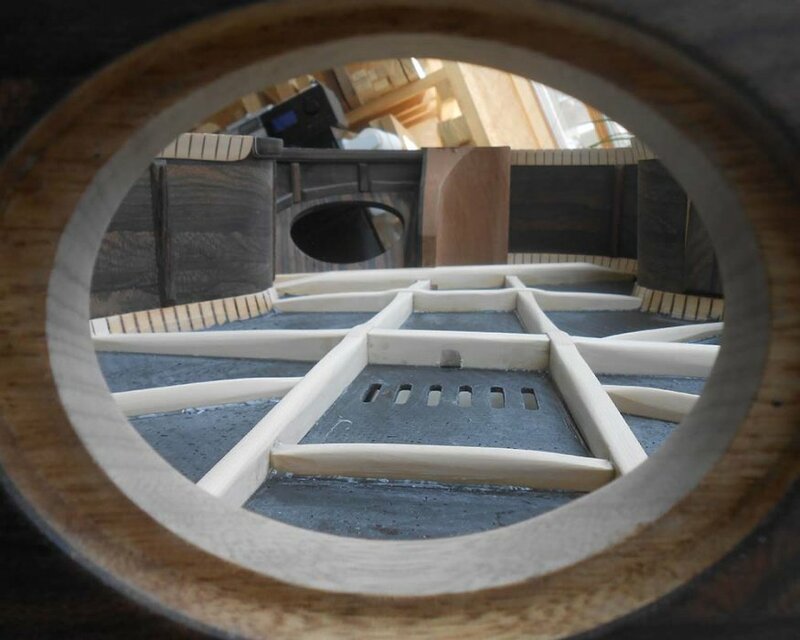 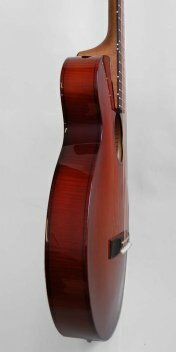 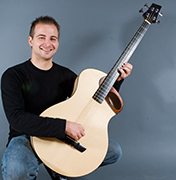 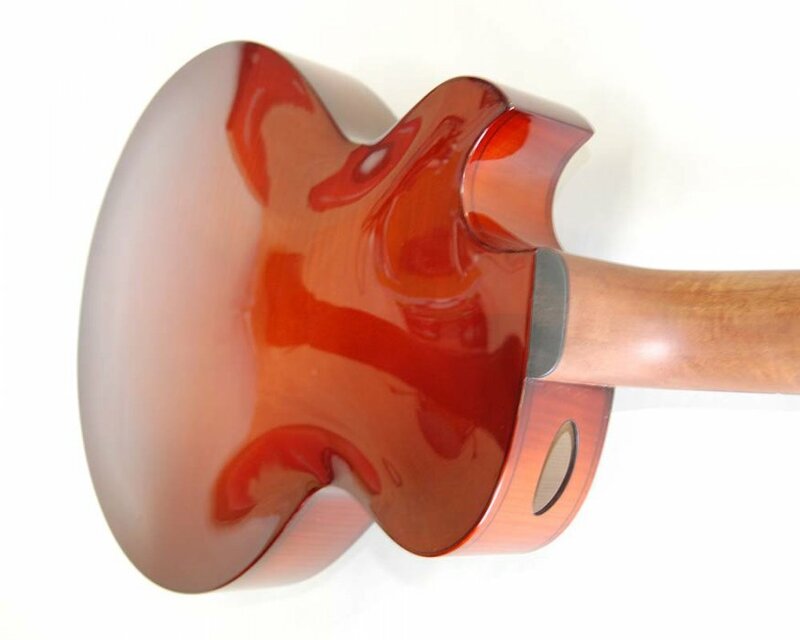 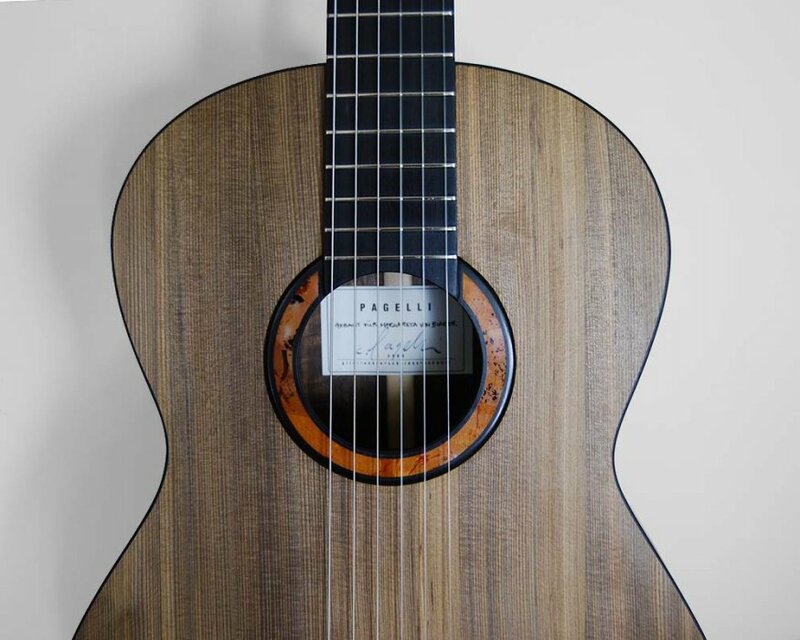 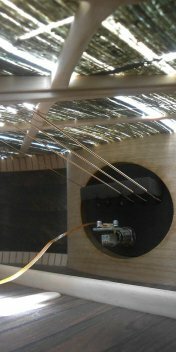 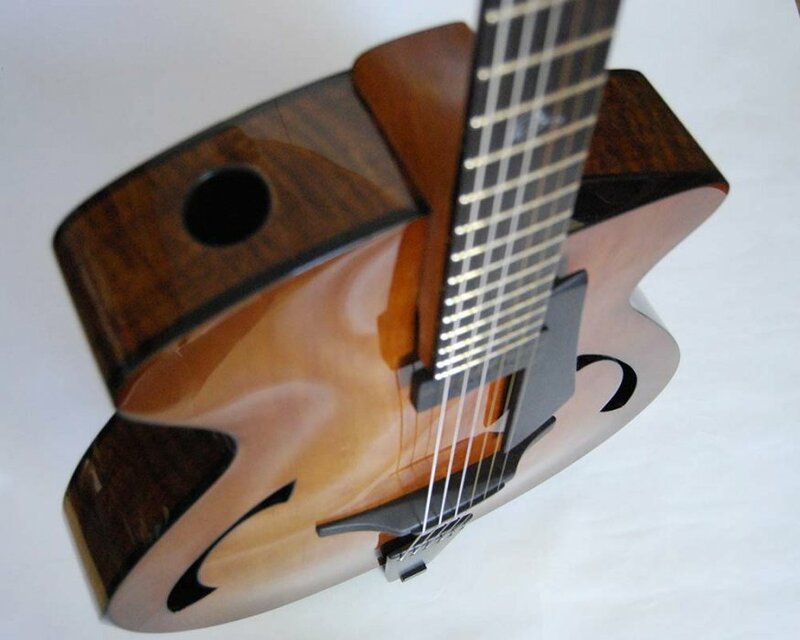 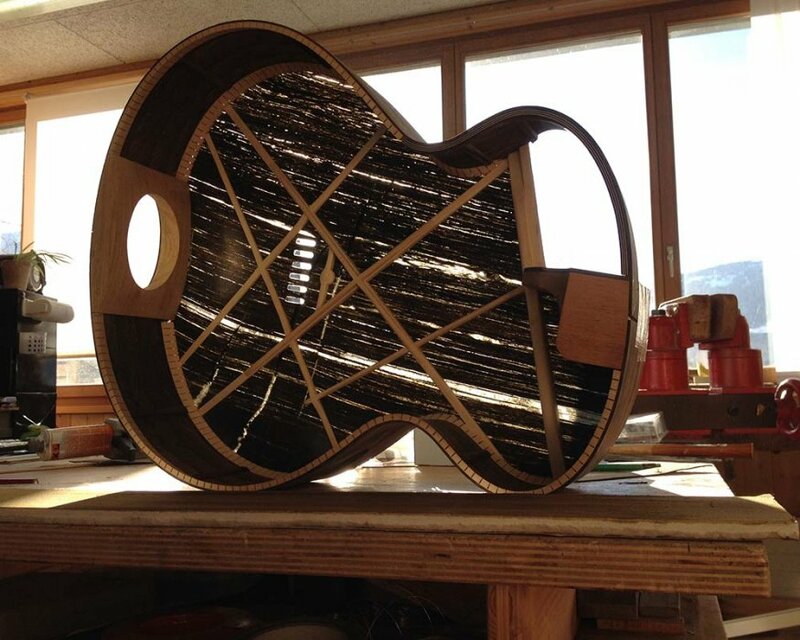 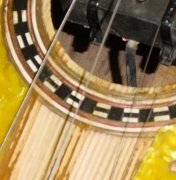 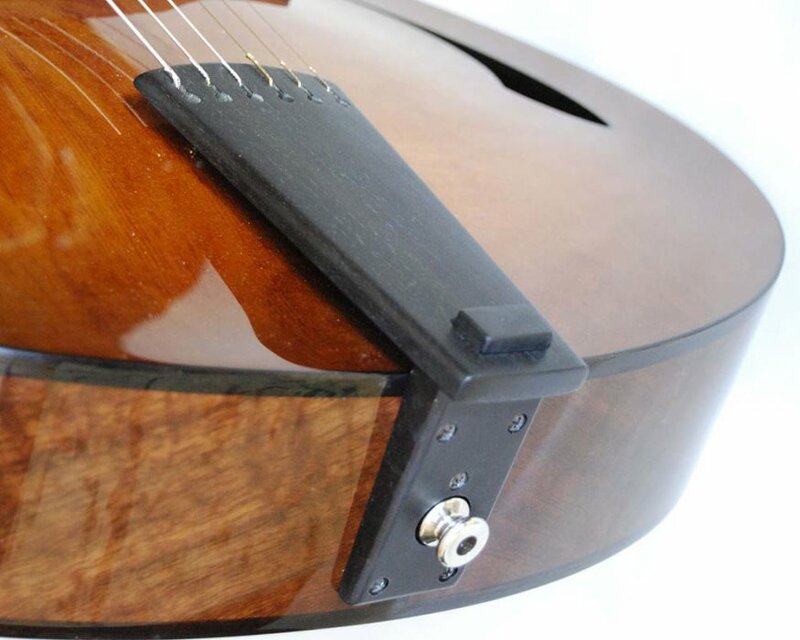 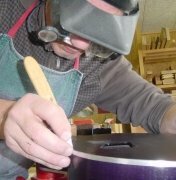 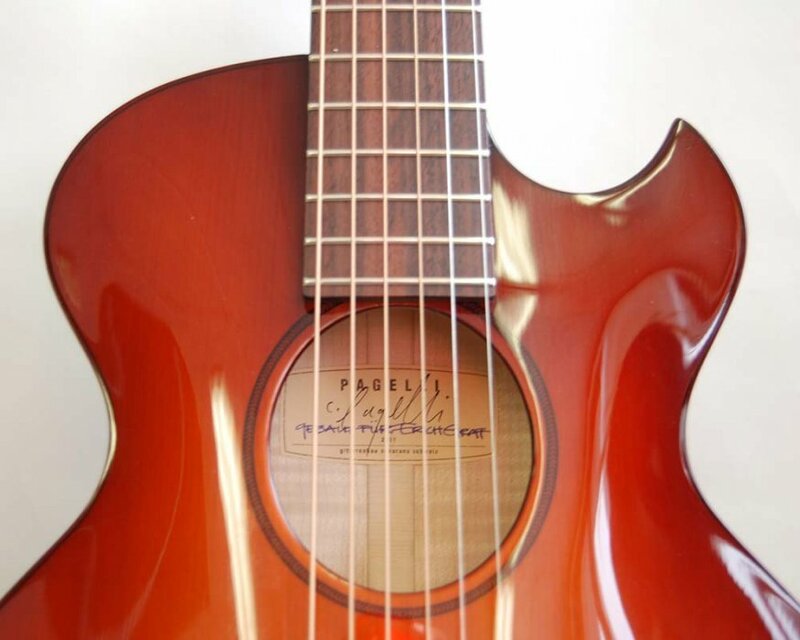 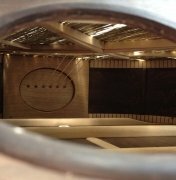 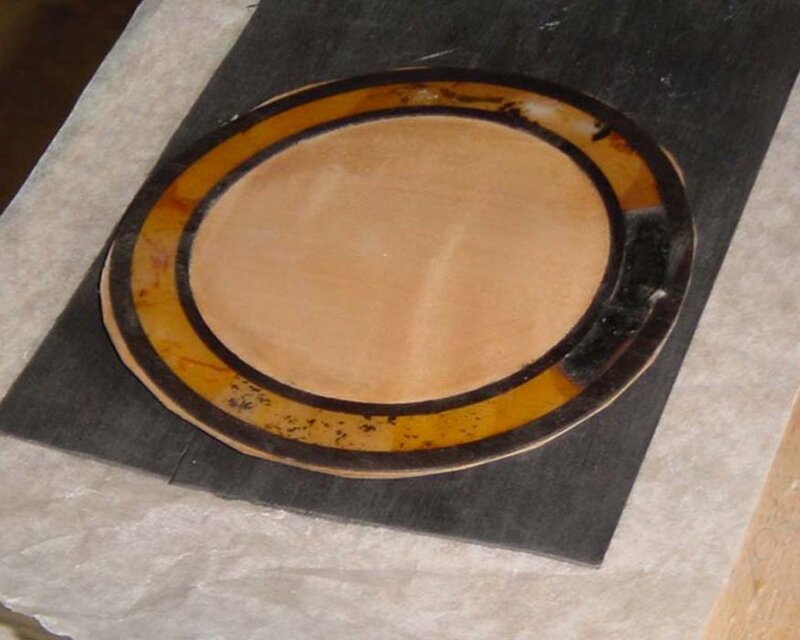 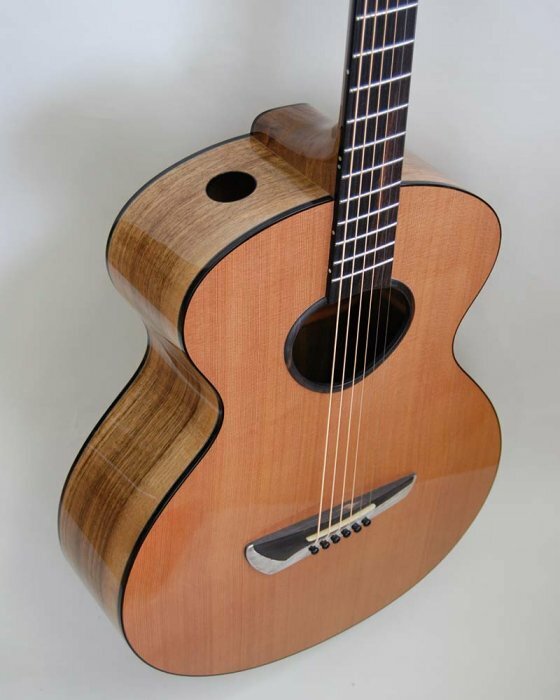 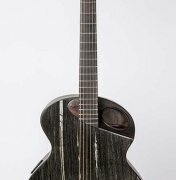 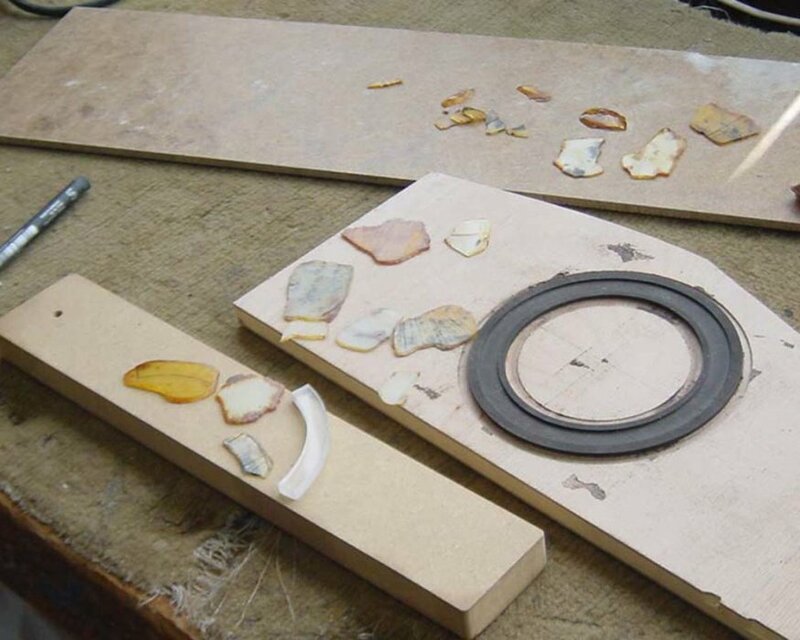 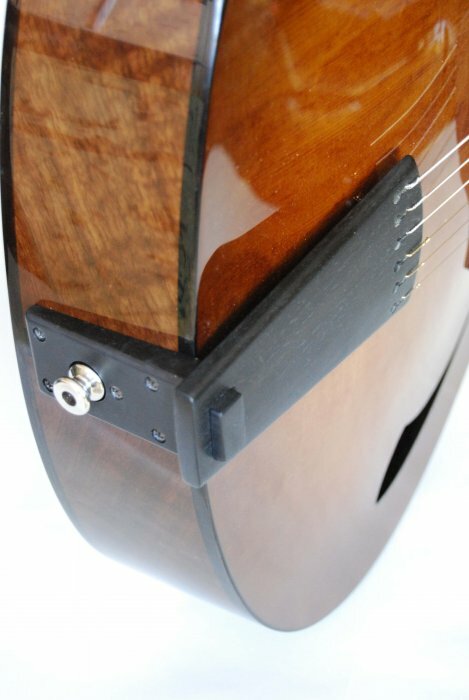 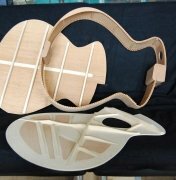 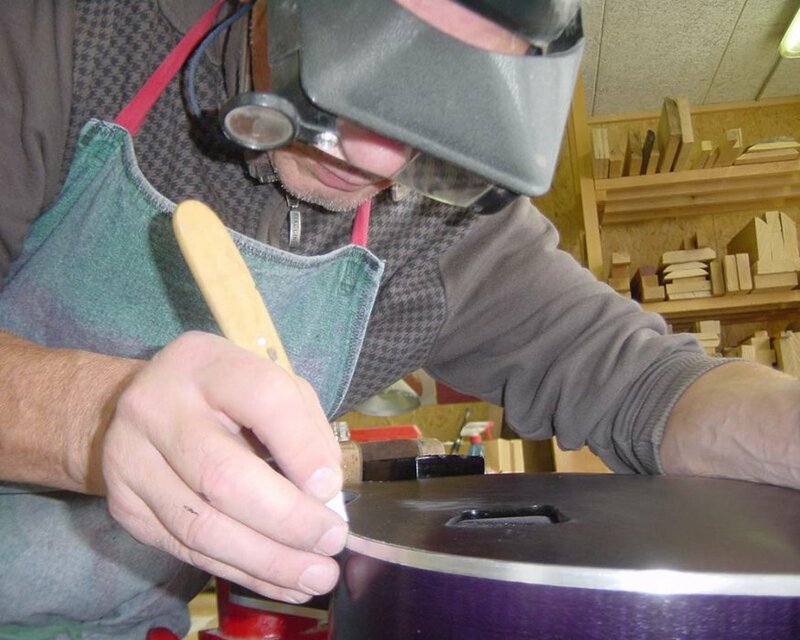 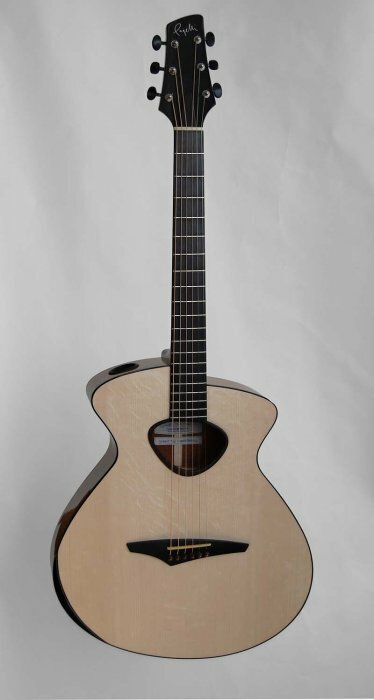 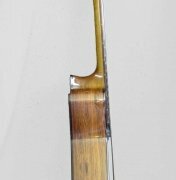 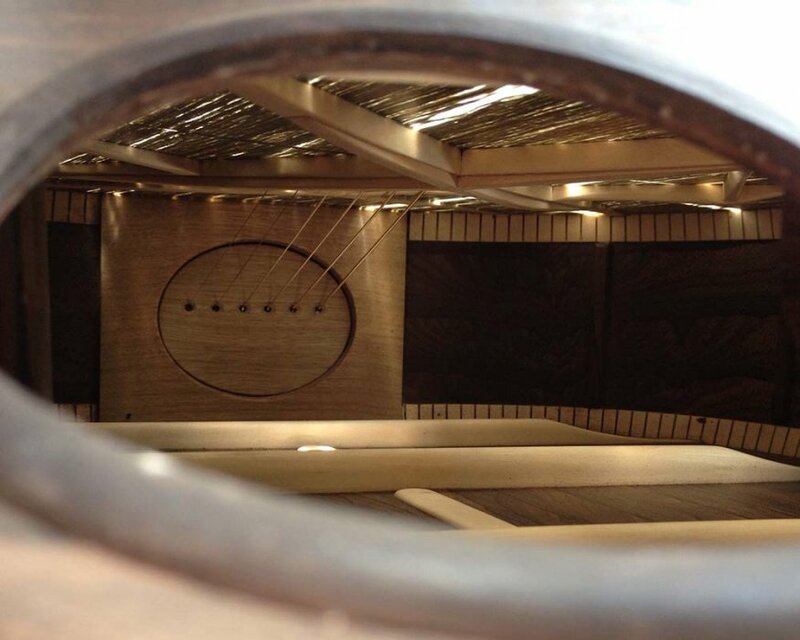 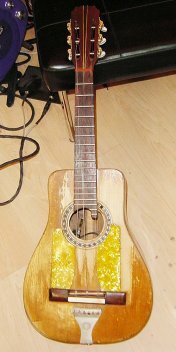 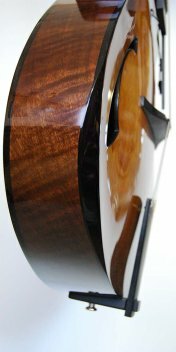 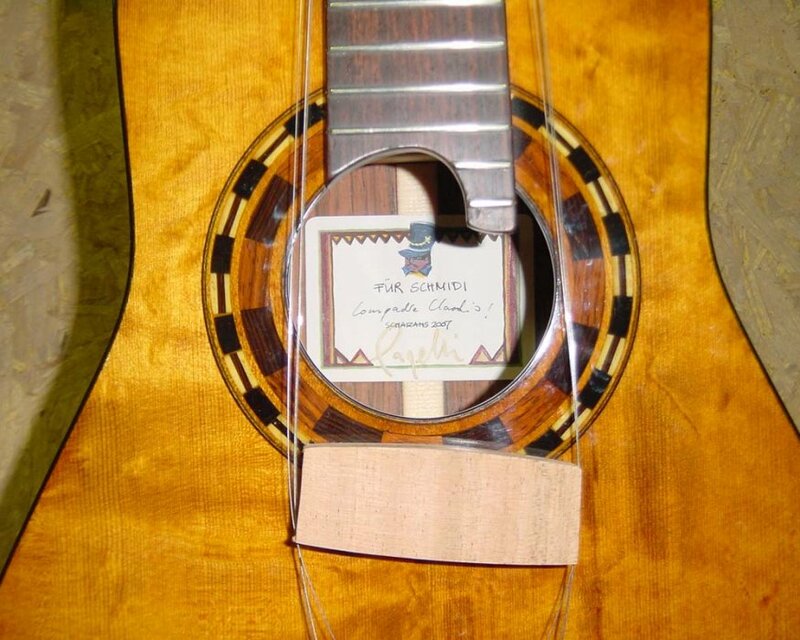 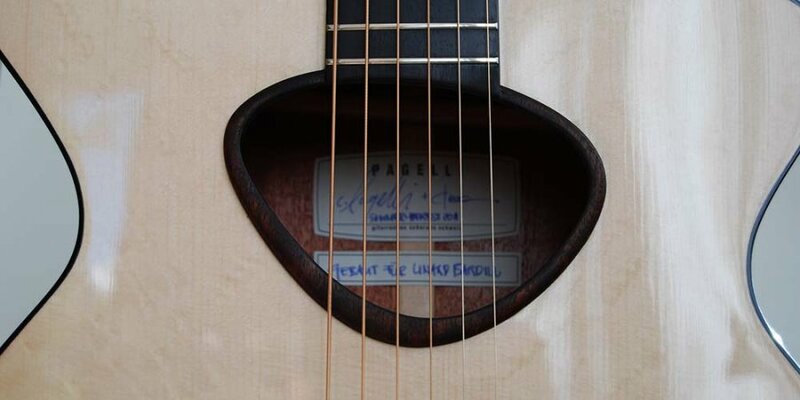 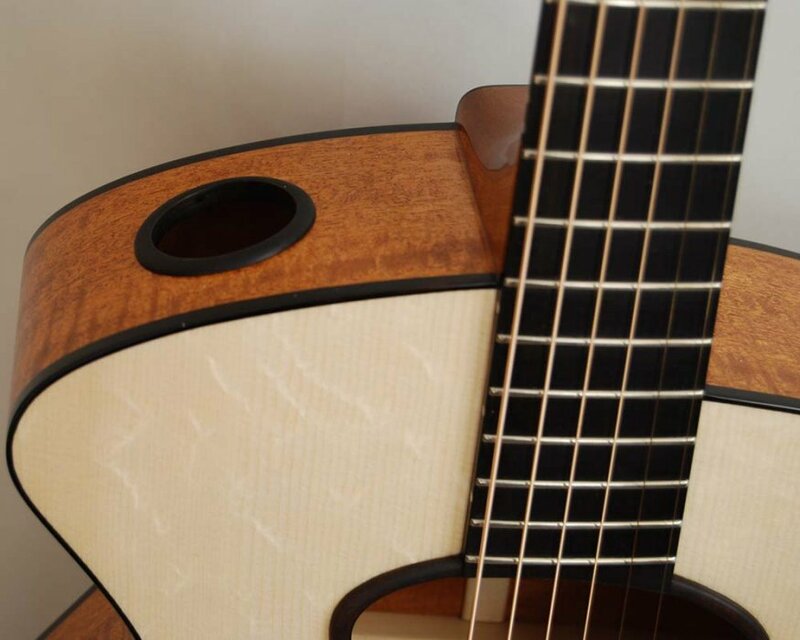 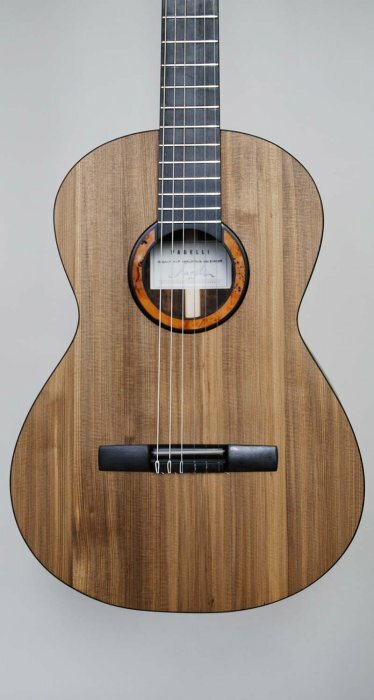 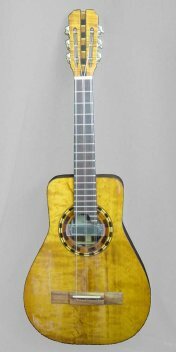 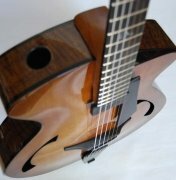 The instrument’s controls are mounted inside the soundhole (see innovations). 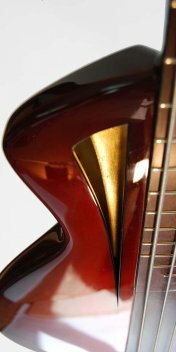 Because Scott is a fan of the 15th century paintings by Caravaggio, we finished the outside of the bass in the red hues that dominate Caravaggio’s works, using a gold finish for the inside. 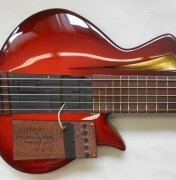 And yes, the bass sounds amazing! 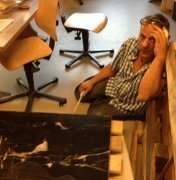 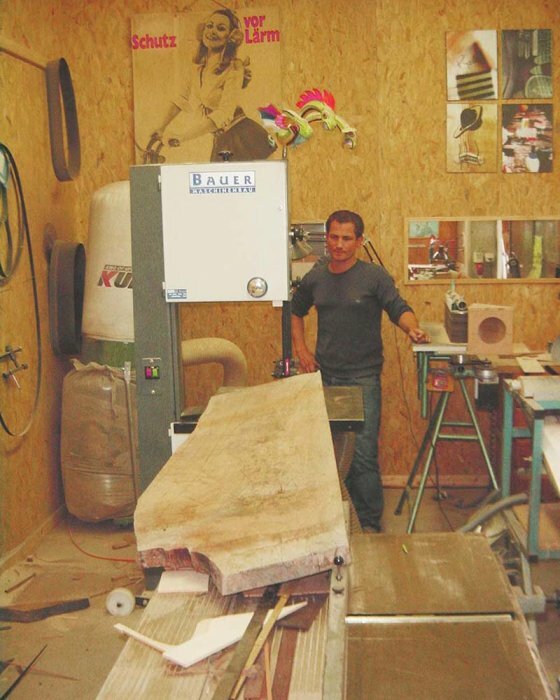 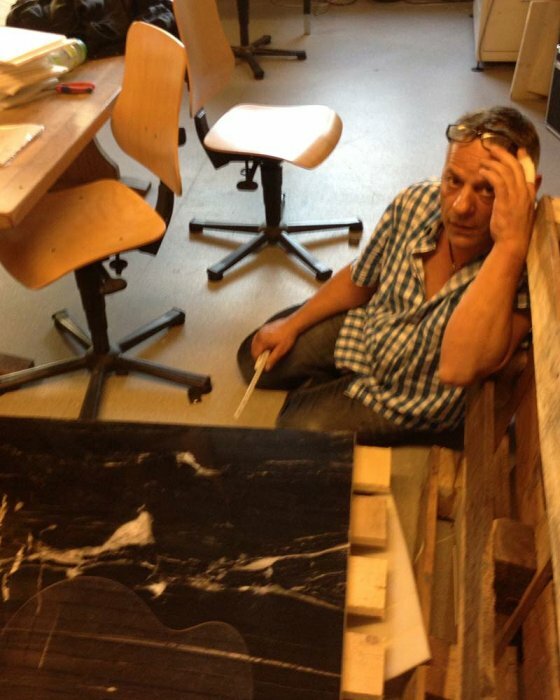 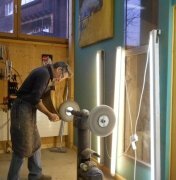 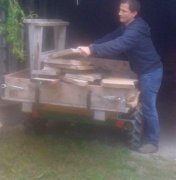 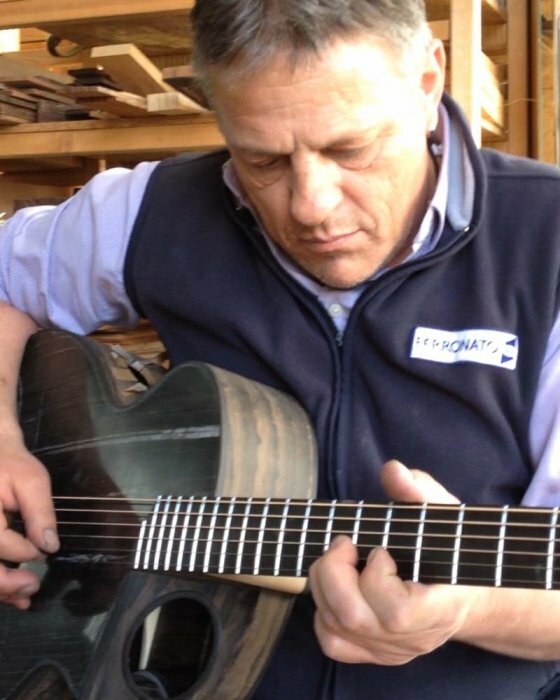 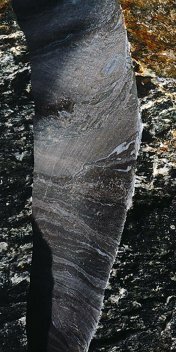 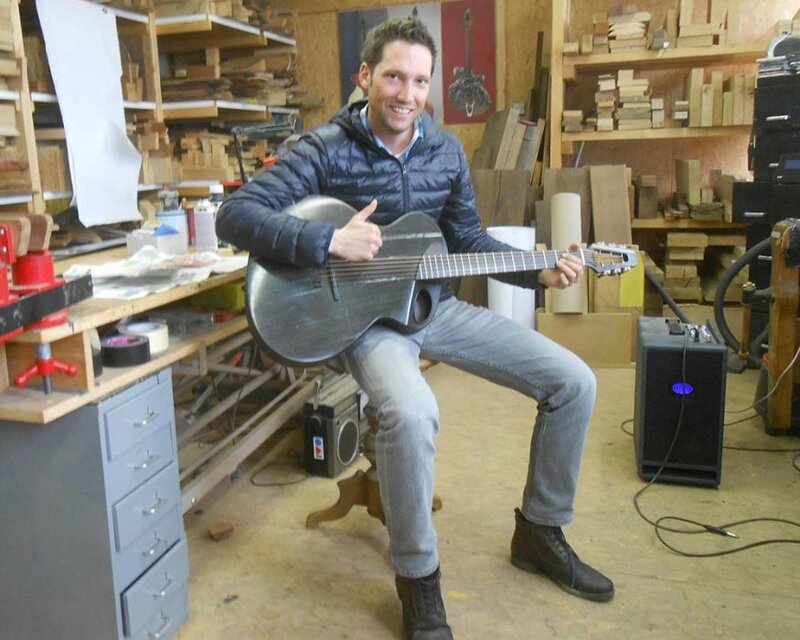 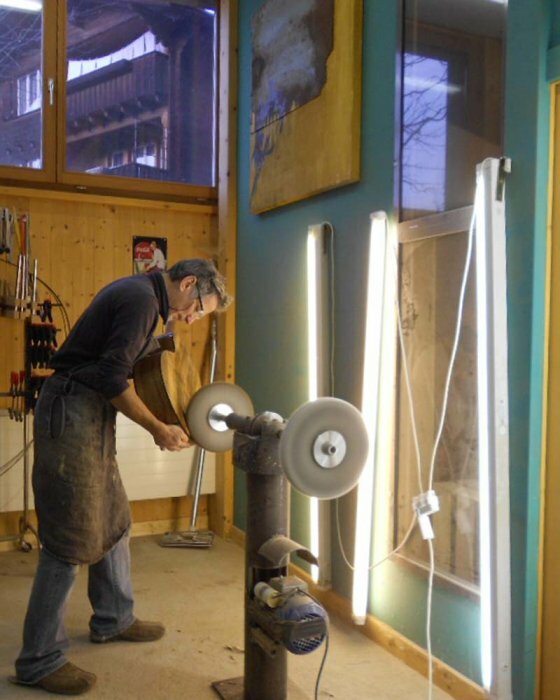 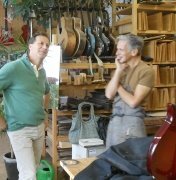 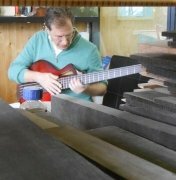 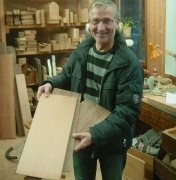 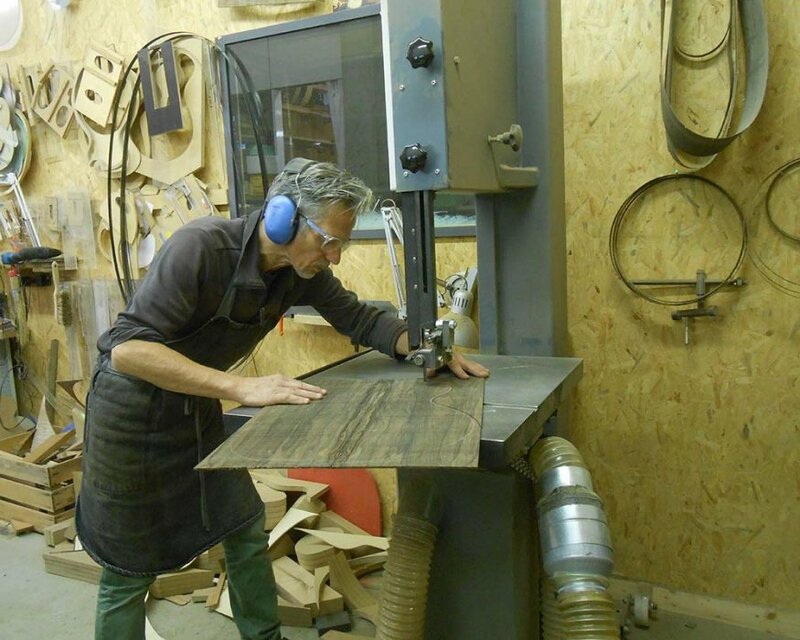 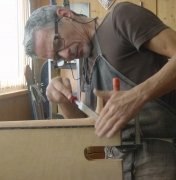 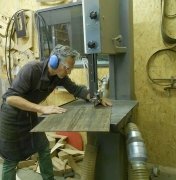 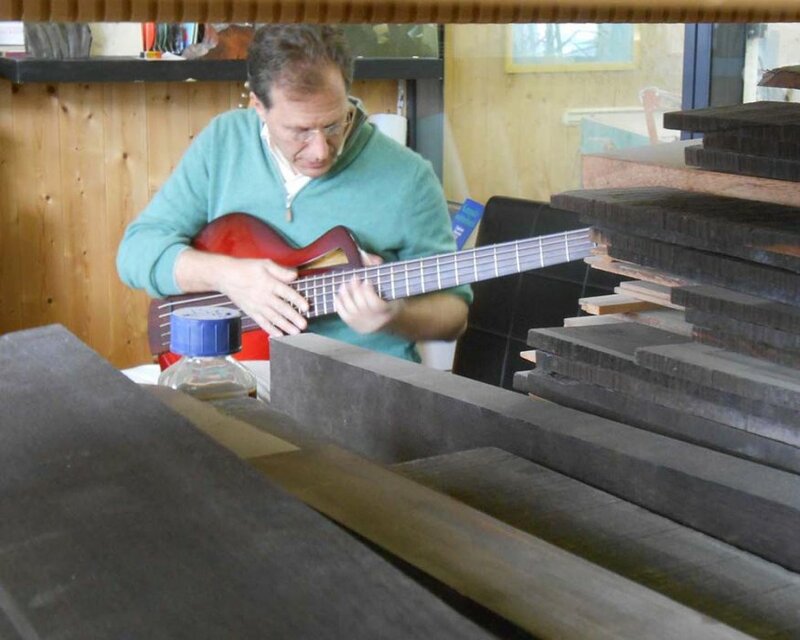 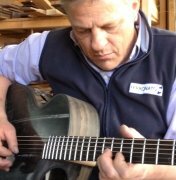 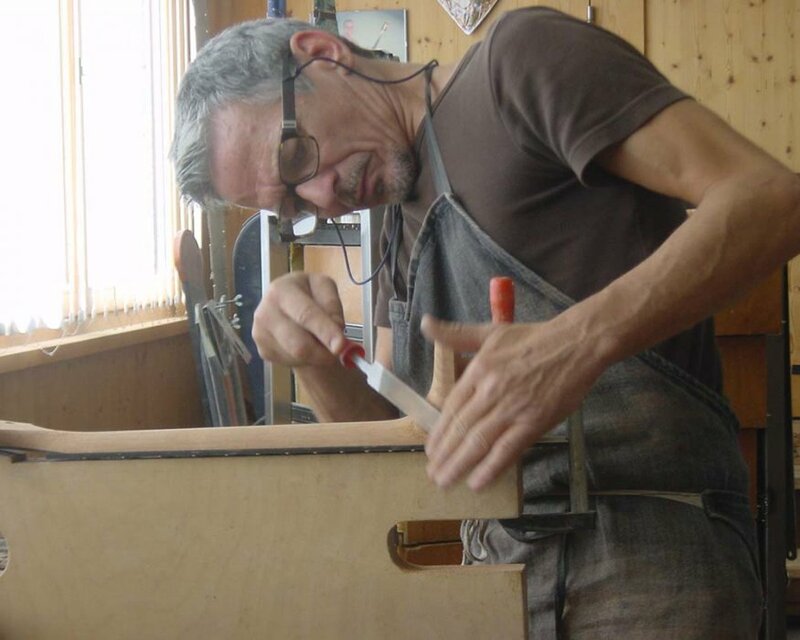 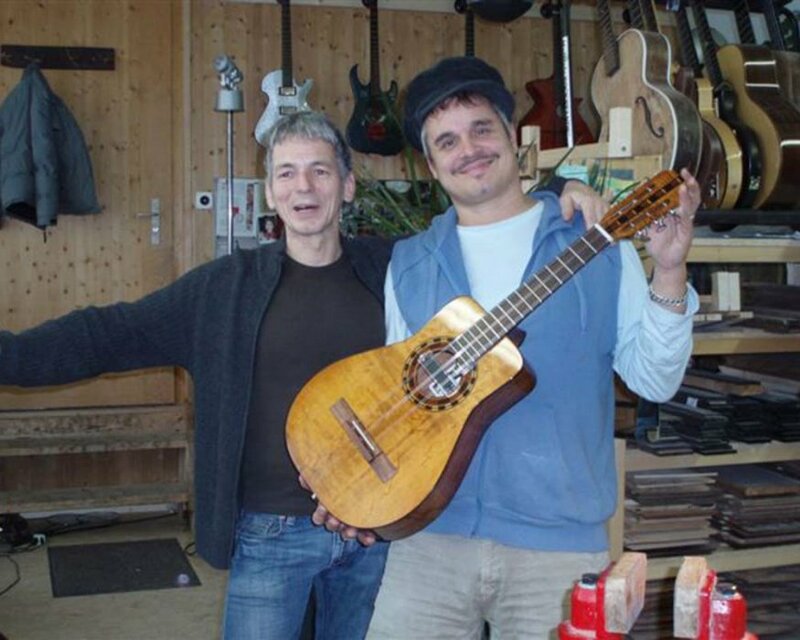 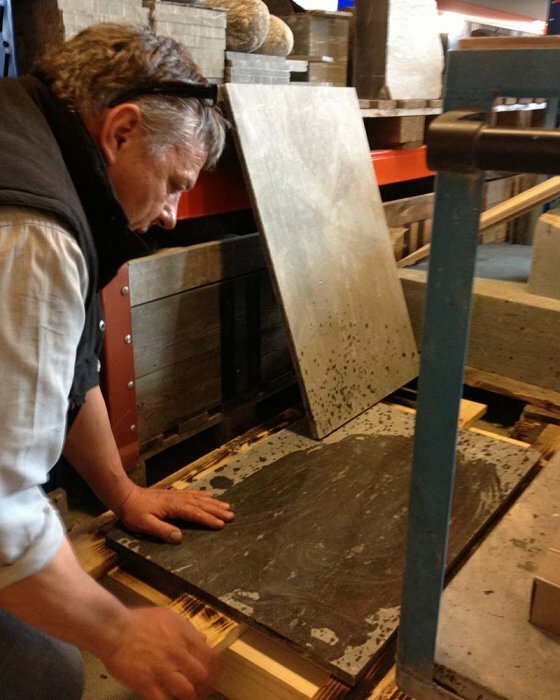 Pius Truffer is the owner of the world-renowned Truffer Natural Stone Quarry in Vals, Switzerland, and he asked us whether we could build a guitar using «his» stone. 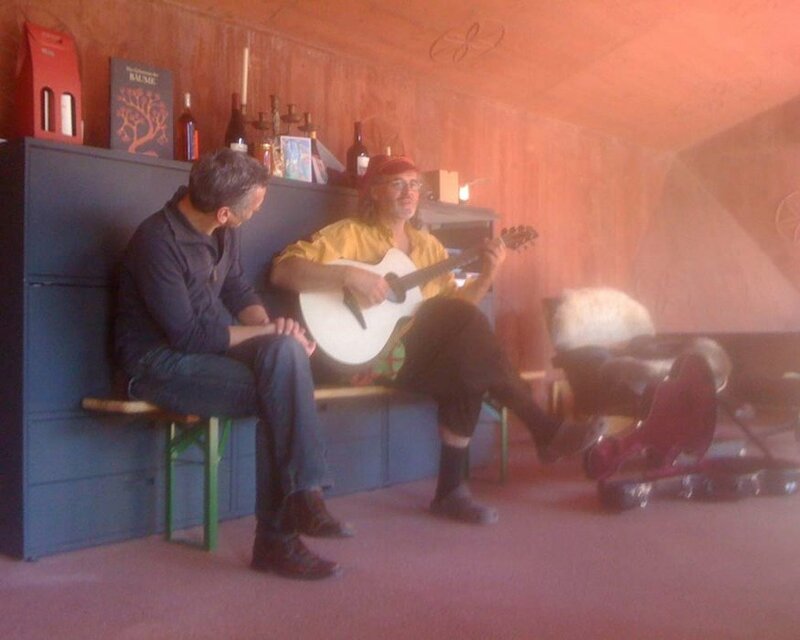 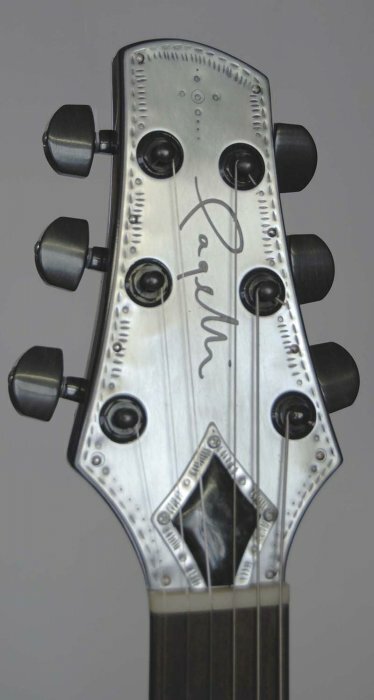 Initially, the conversation was about an electric guitar, but after talking with Pius, it became clear that it had to be an acoustic, as he wanted to hear the sound of the stone, not that of the electronics. 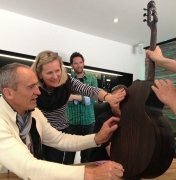 It goes without saying that this project was a major challenge - it was something that had never been done before - but that’s where the fun begins! 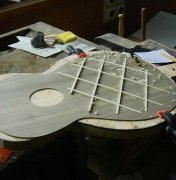 Using stone for the entire instrument would have been too heavy, both in terms of the actual weight and the sound of the guitar. 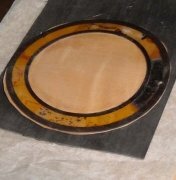 Accordingly, we decided to combine a top made out of Vals Quartzite with a back and sides made out of ziricote wood. 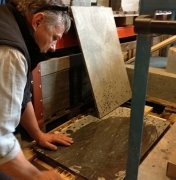 The stone top started out as a boulder weighing several tons, and many hours of cutting and sanding brought it to a final thickness of just 1 millimeter! 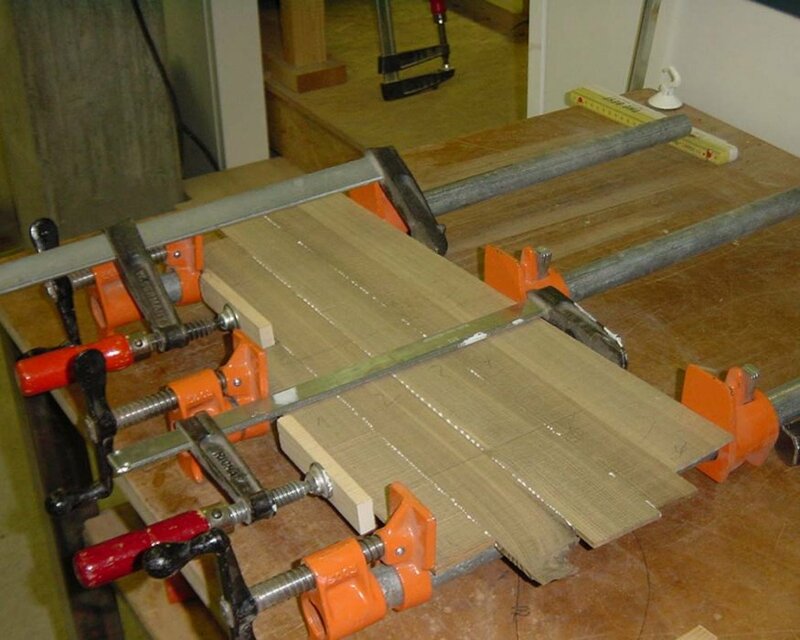 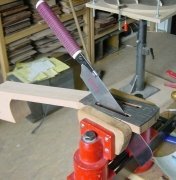 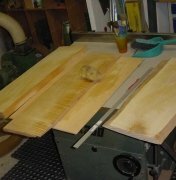 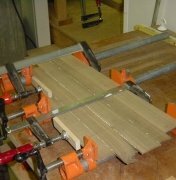 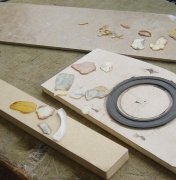 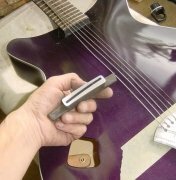 Stone is of course extremely strong in terms of resisting great pressure, but it’s not good at withstanding the torque that’s applied to the soundboard of a traditional flattop. 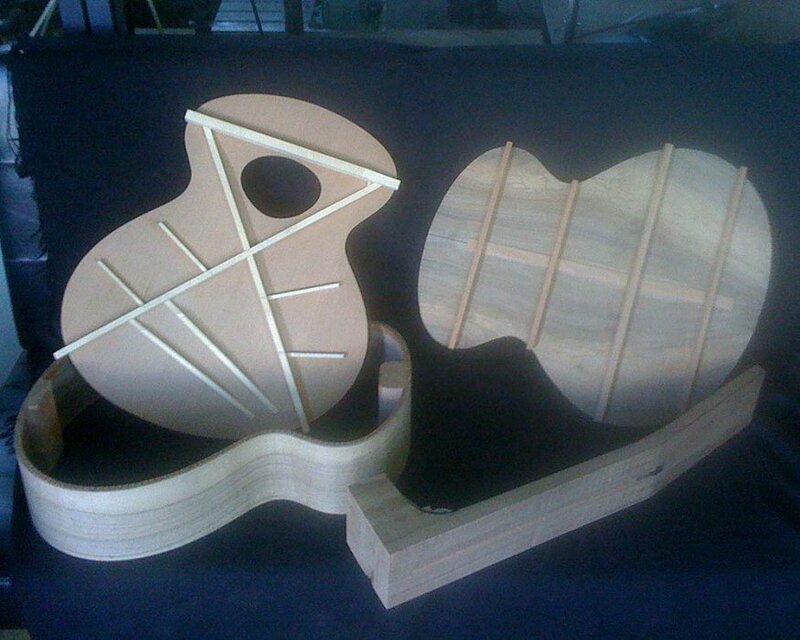 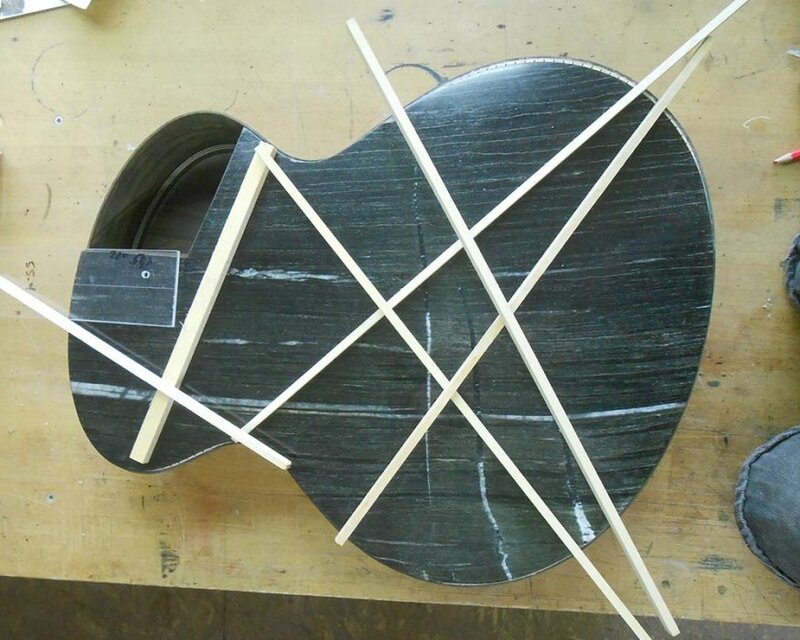 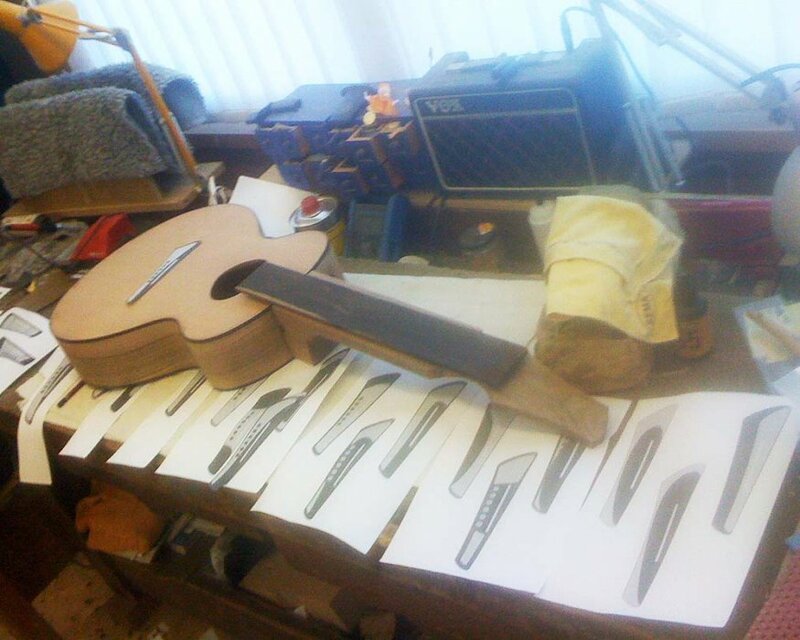 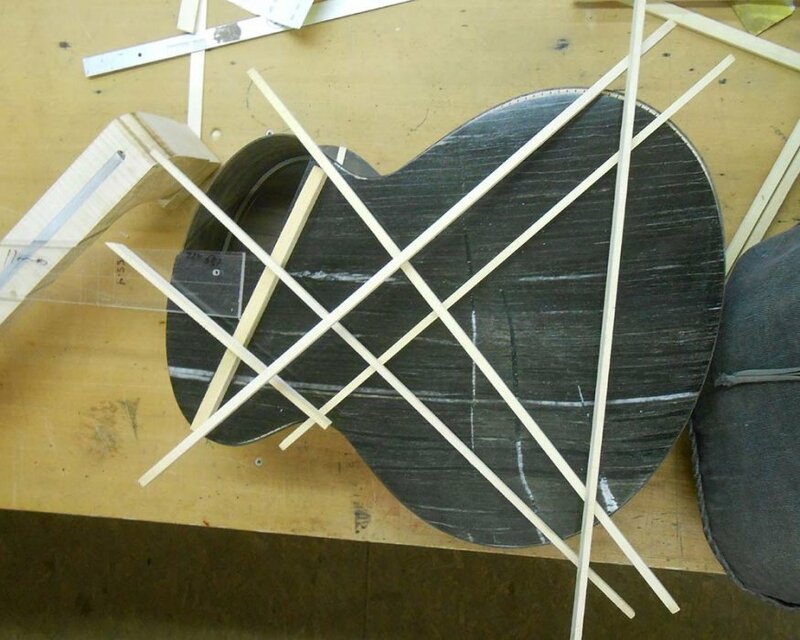 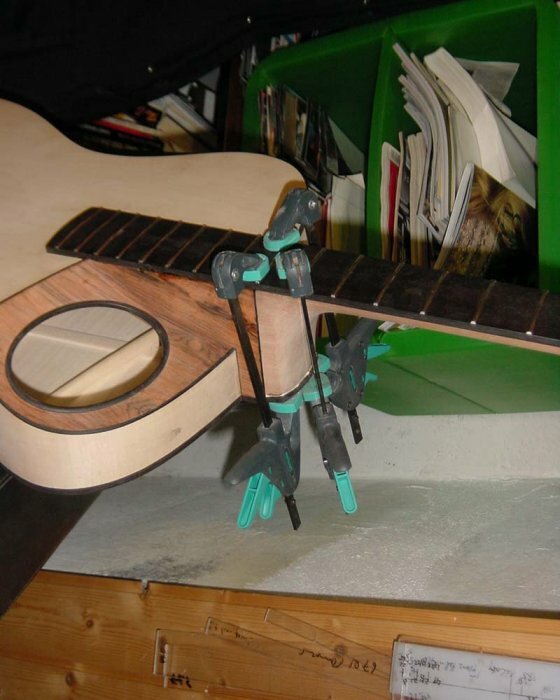 As a result, we had to come up with a completely new way of guitar construction. 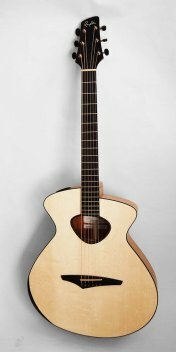 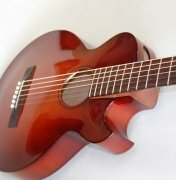 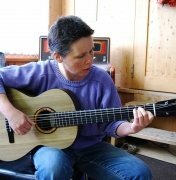 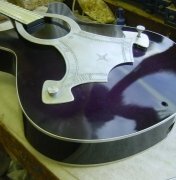 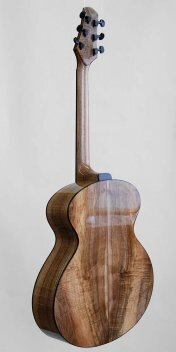 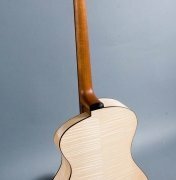 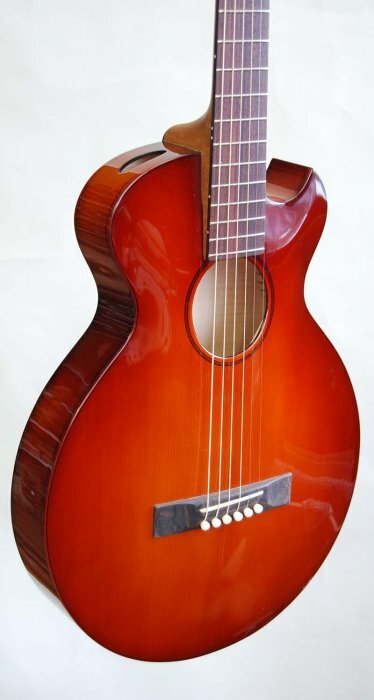 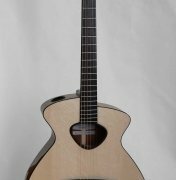 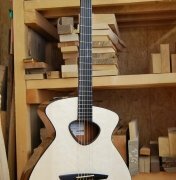 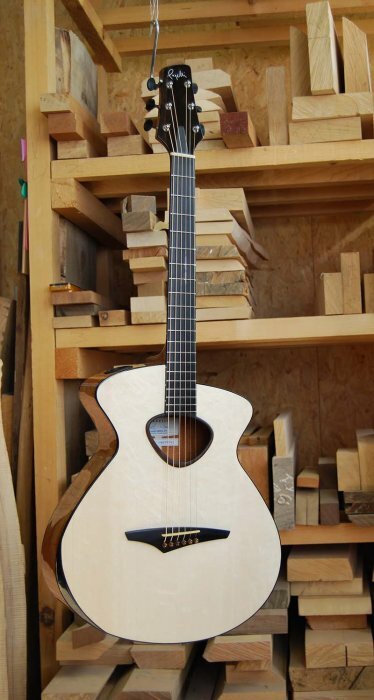 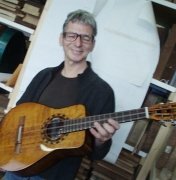 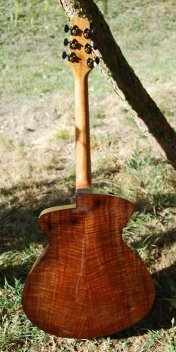 Combining various building styles, we ended up not only the first acoustic guitar with a stone top, but also our first flattop guitar that uses an archtop’s string path. 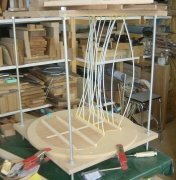 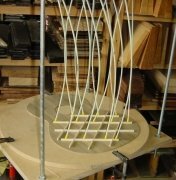 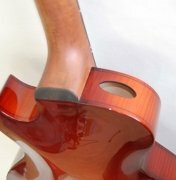 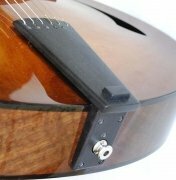 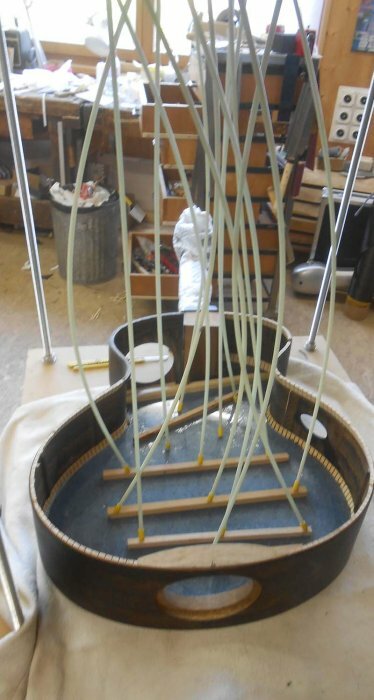 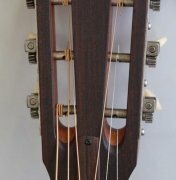 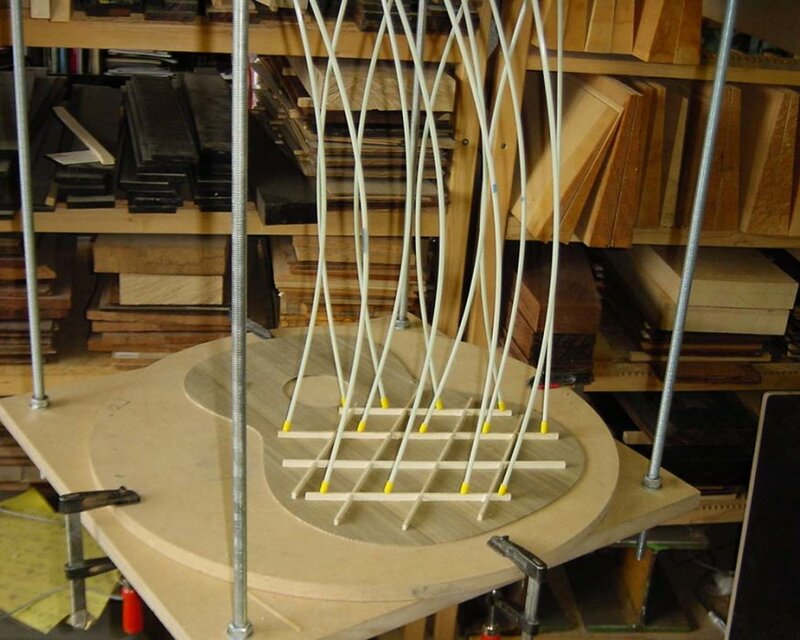 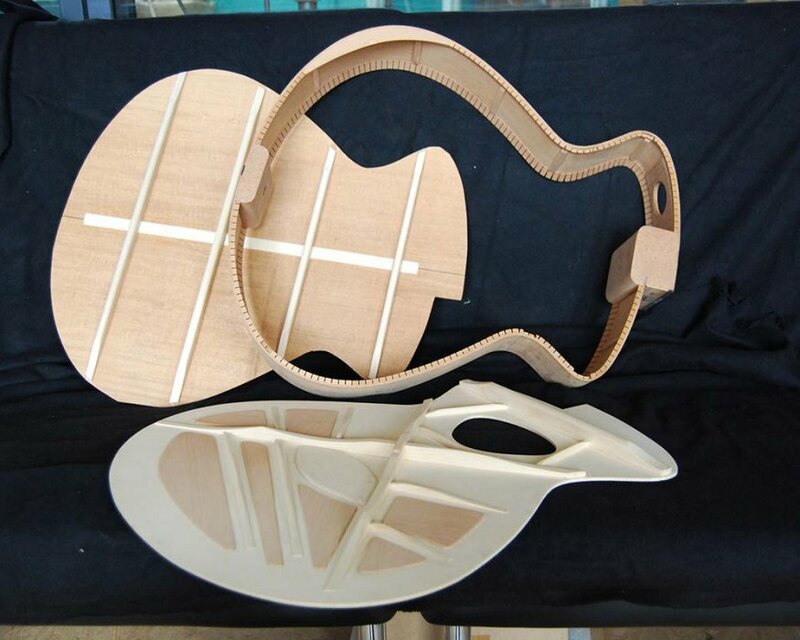 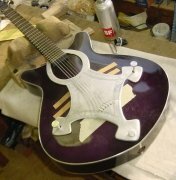 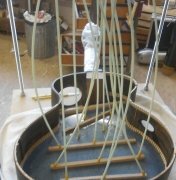 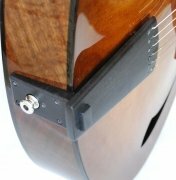 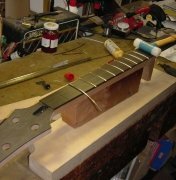 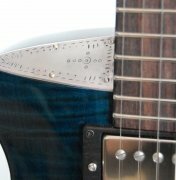 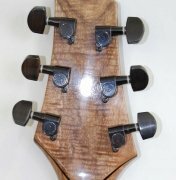 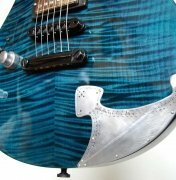 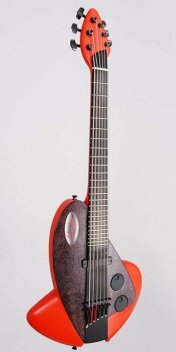 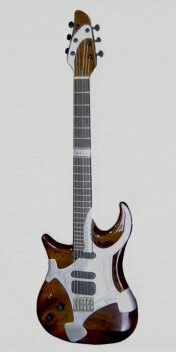 In order to achieve the necessary string angle for exerting enough pressure on the guitar’s floating bridge, we fed the strings through small holes in the top, then attached the strings to a removable panel in the end-block (see section on innovations). 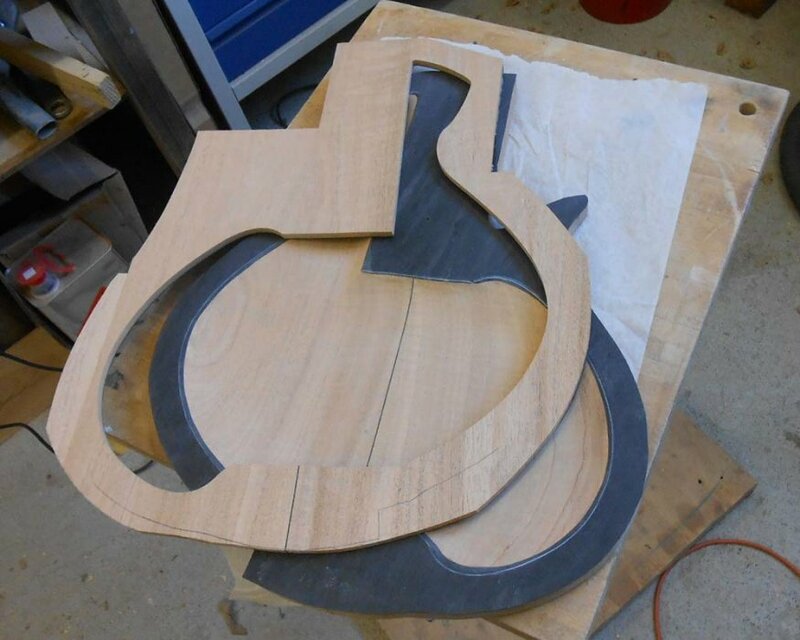 Completing this project took great efforts, but the results are very surprising, and we’re very proud of it. 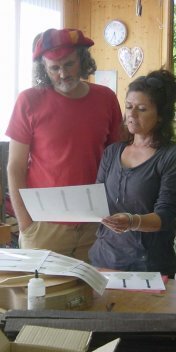 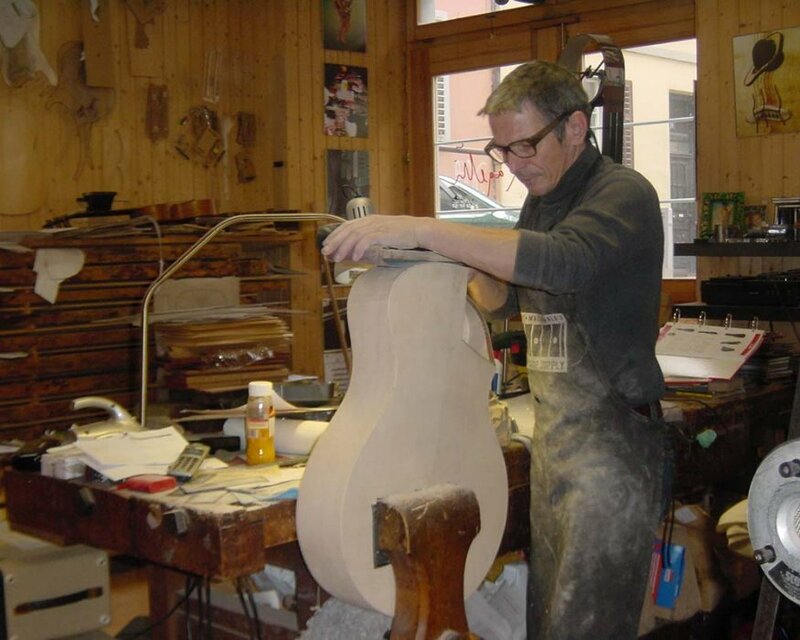 A special word of thanks goes to Marco Mainetti, who made the top, and without whom it would have been impossible to realize the original vision. 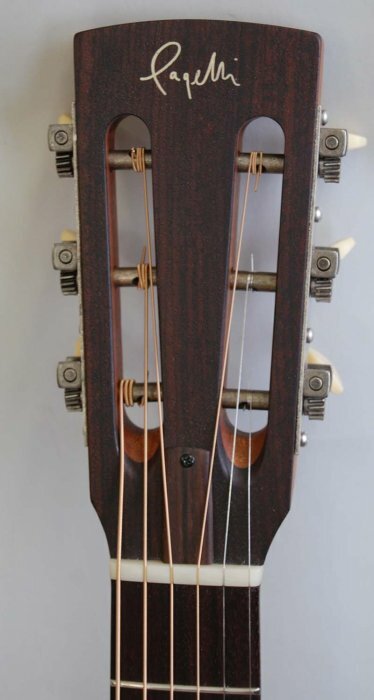 Something «Gibsonesque» from about 1900? 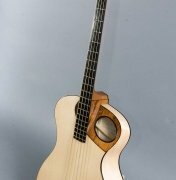 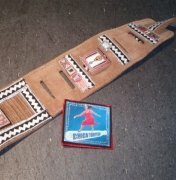 Would we be able to use some of our wood from the ’30s? 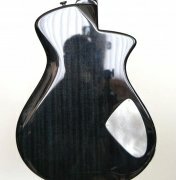 It turned out to be a small, somewhat austere guitar with a sound so beautiful that it might make you cry. 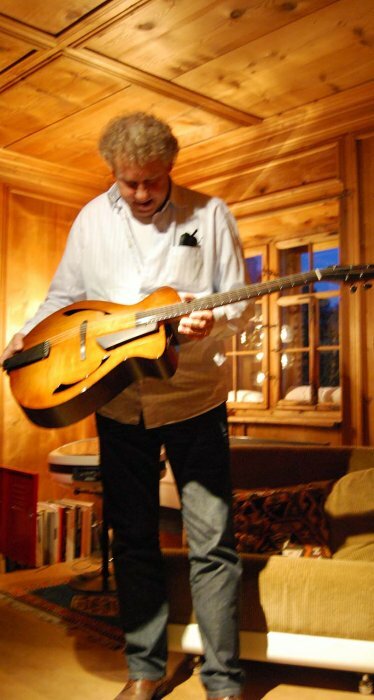 Everyone who plays it doesn’t want to give it back; most of all, its owner, Erich Graf. 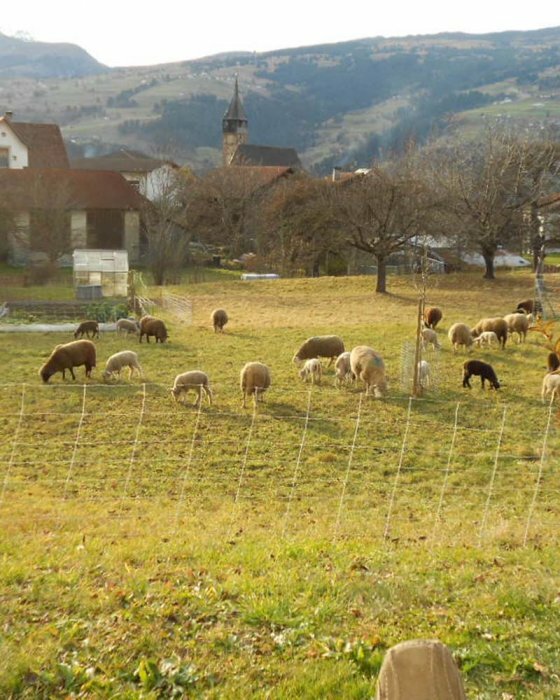 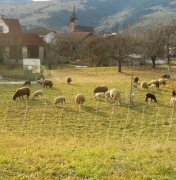 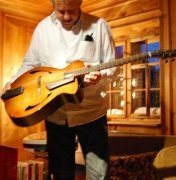 Possessing a voice that’s strong and polarizing in every way, Linard Bardill is probably Switzerland’s most popular singer-songwriter. 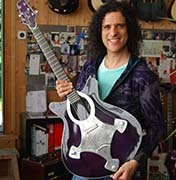 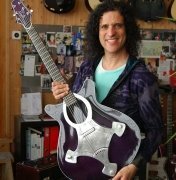 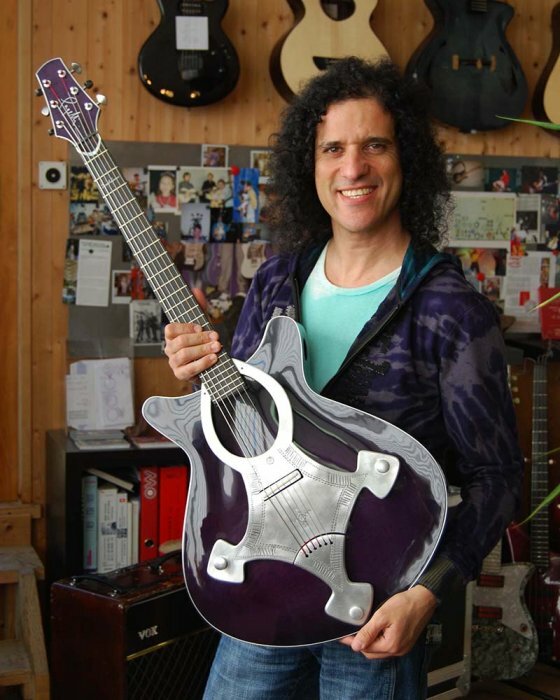 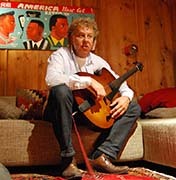 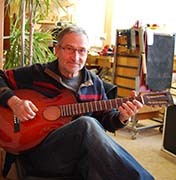 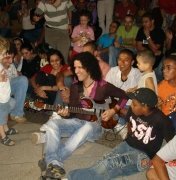 His request for the instrument was more difficult than it may appear: He wanted the guitar to support his vocals without getting in their way, and also be responsive to his playing technique. 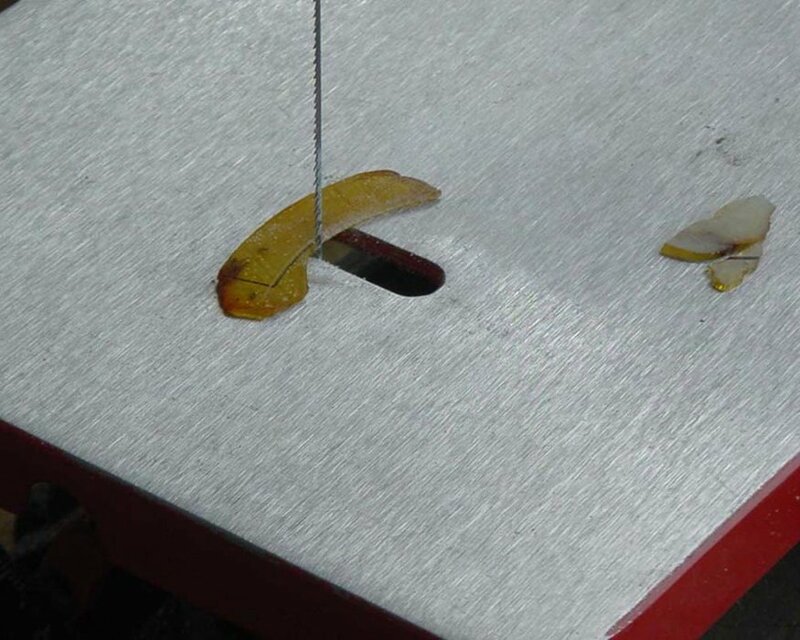 Ordinarily, this wouldn’t be hard to accomplish, but he has two completely different voices; one low, and another, that’s very powerful and high. 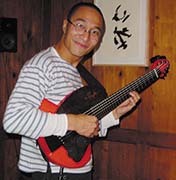 And he has two ways of playing the guitar: On the one hand, he fingerpicks softly, on the other, he often strums with a heavy attack. 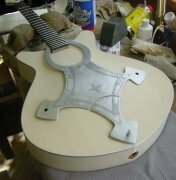 The guitar also needed to be strong and sturdy, as he moves a lot on stage and can’t always take care of his instrument. 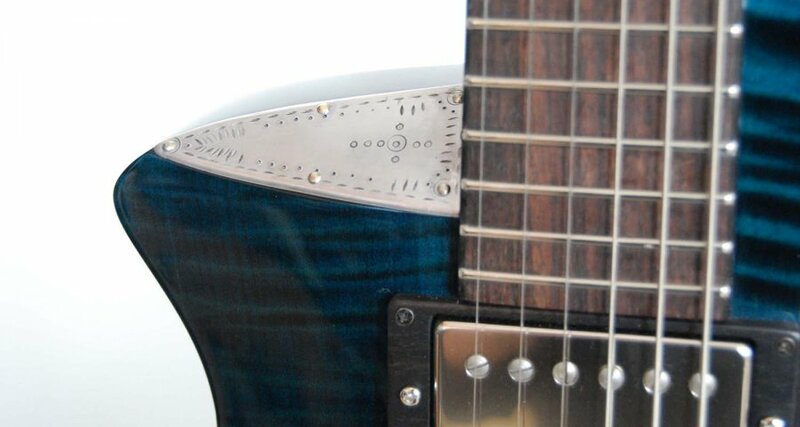 Oh, and it would be great if the guitar was resistant to feedback. 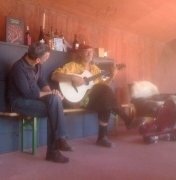 We studied Linard’s playing, went to hear him live, talked to his producer and his engineer, and after a while, we decided on how to proceed. 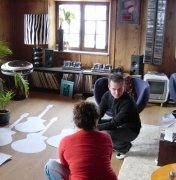 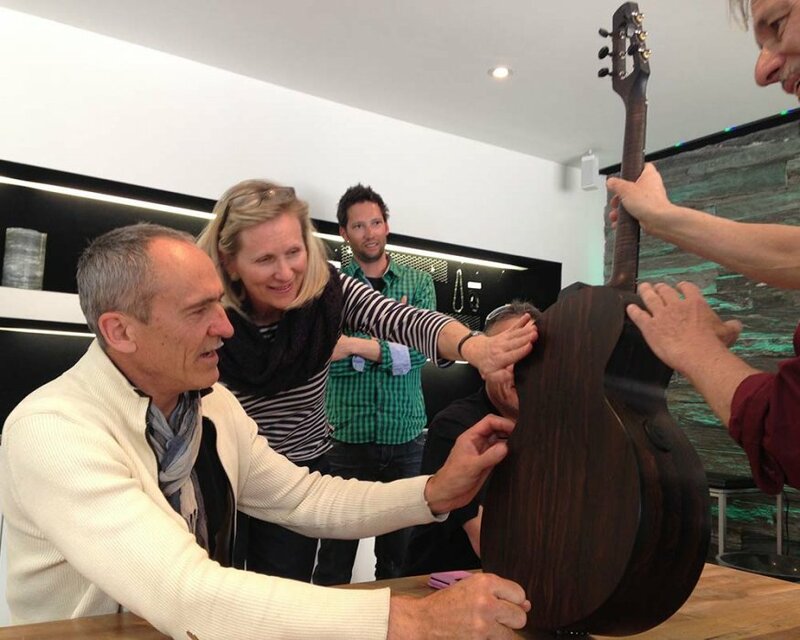 But of course we didn’t know whether we were on the right track until the guitar was done. 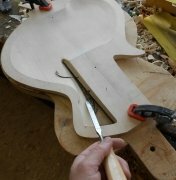 Spoiler alert: It worked! 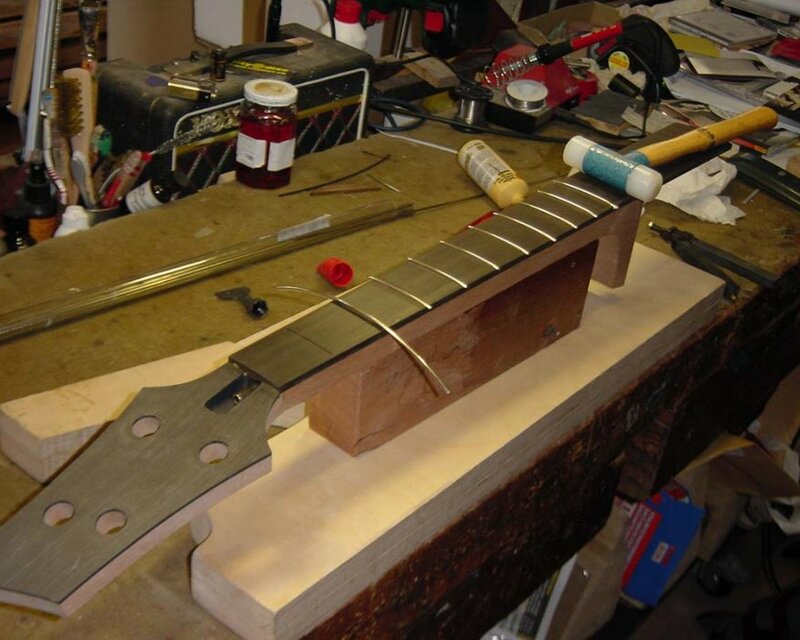 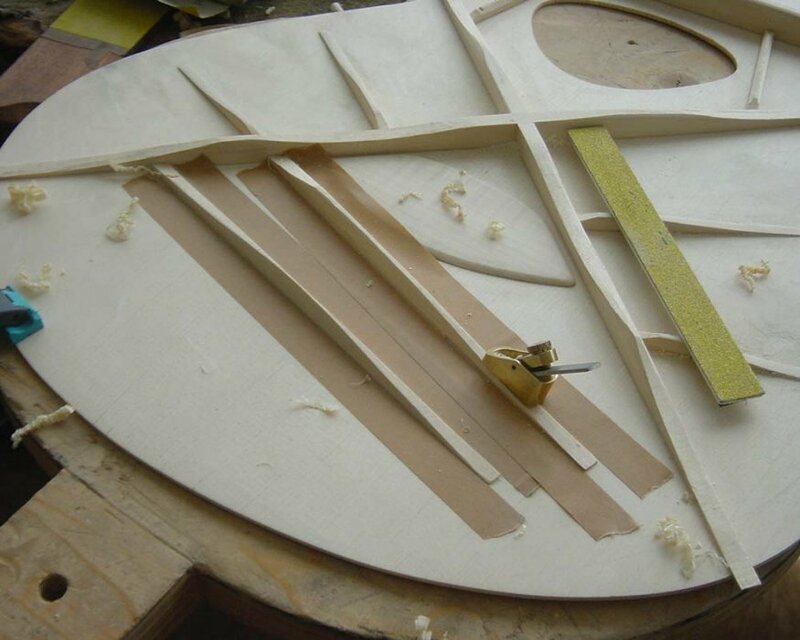 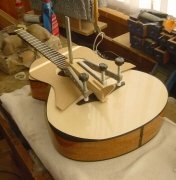 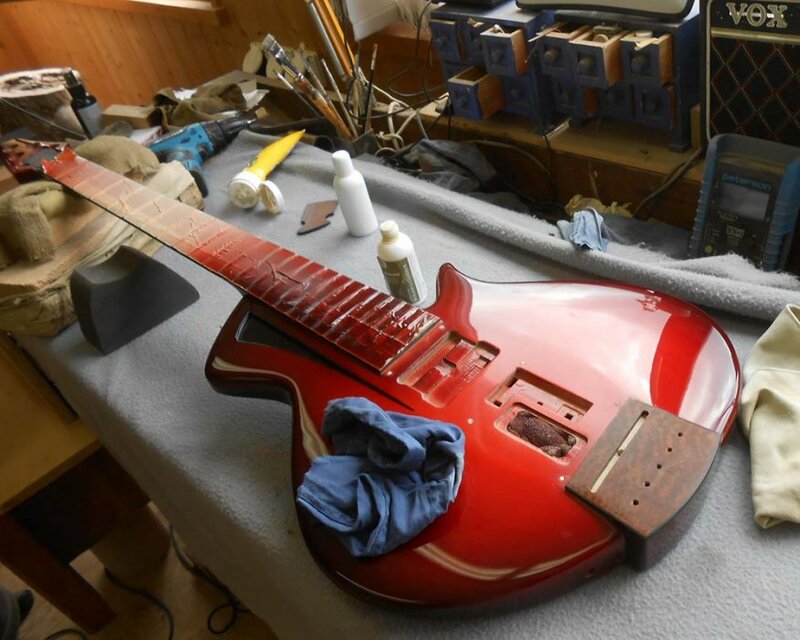 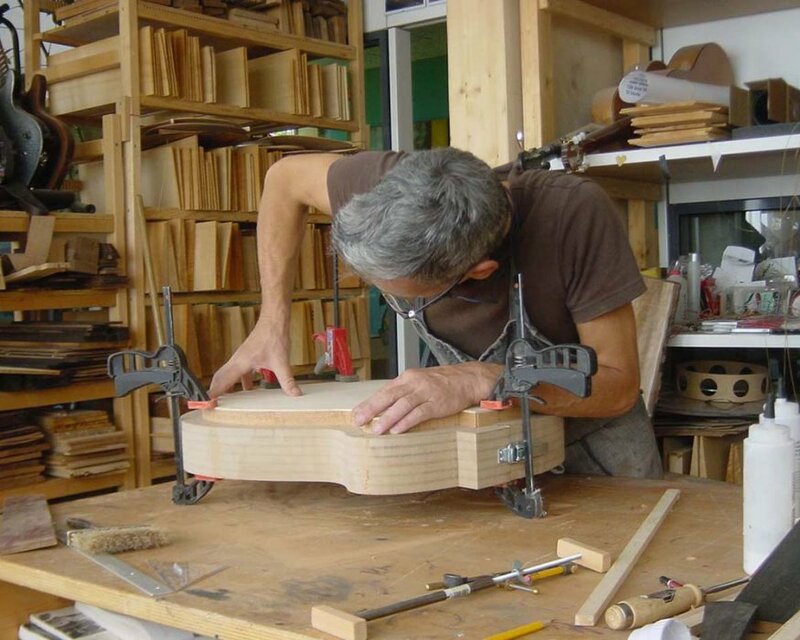 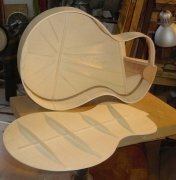 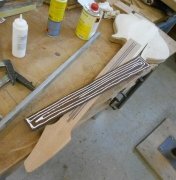 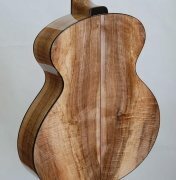 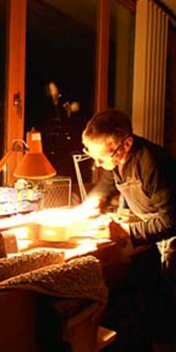 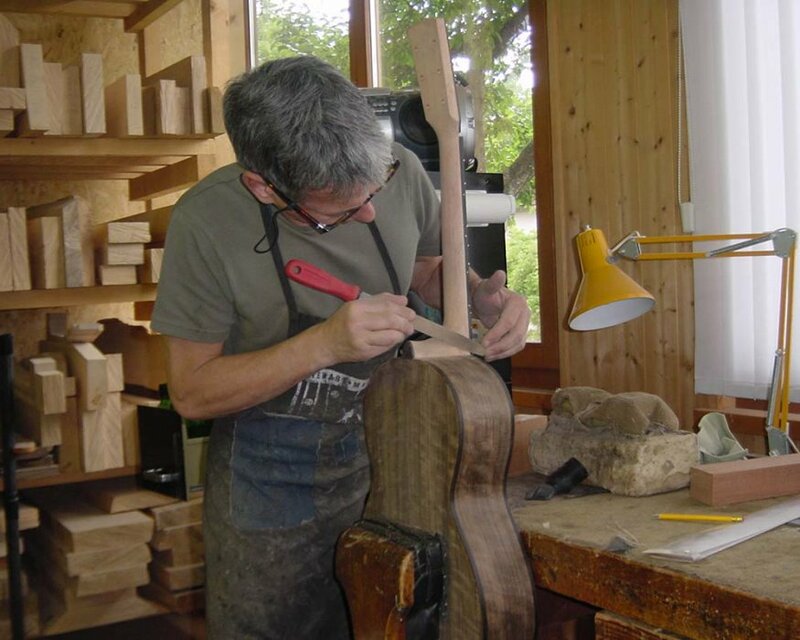 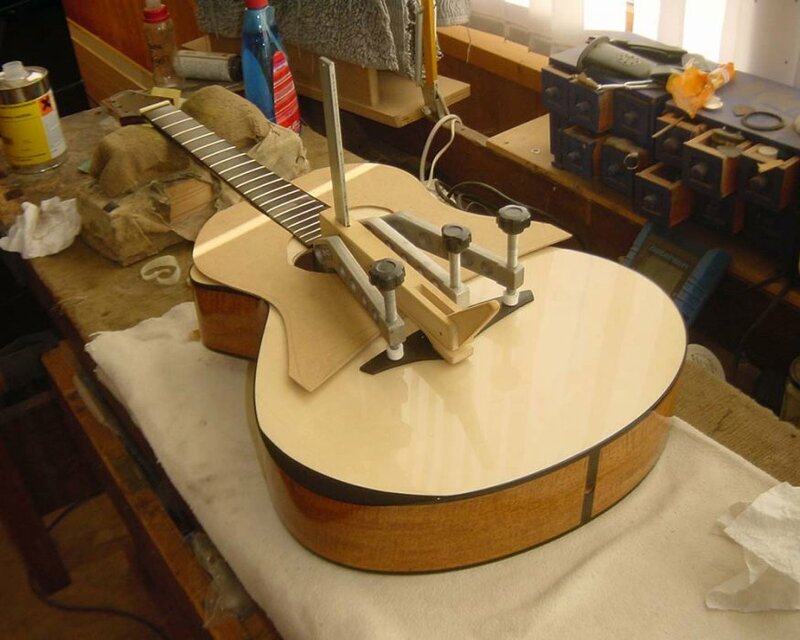 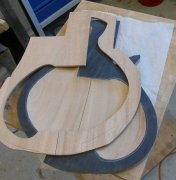 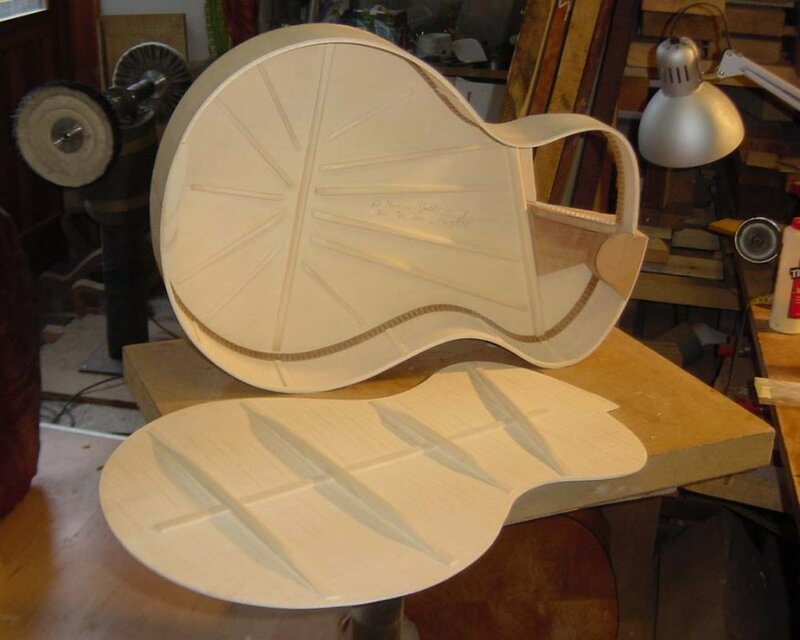 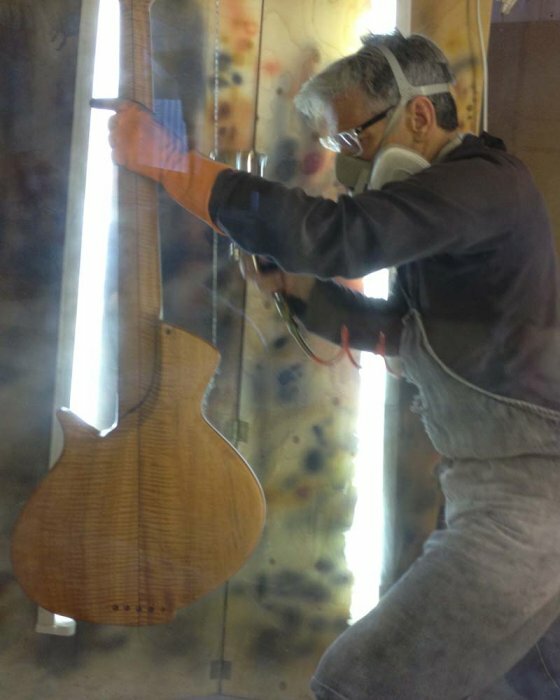 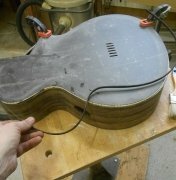 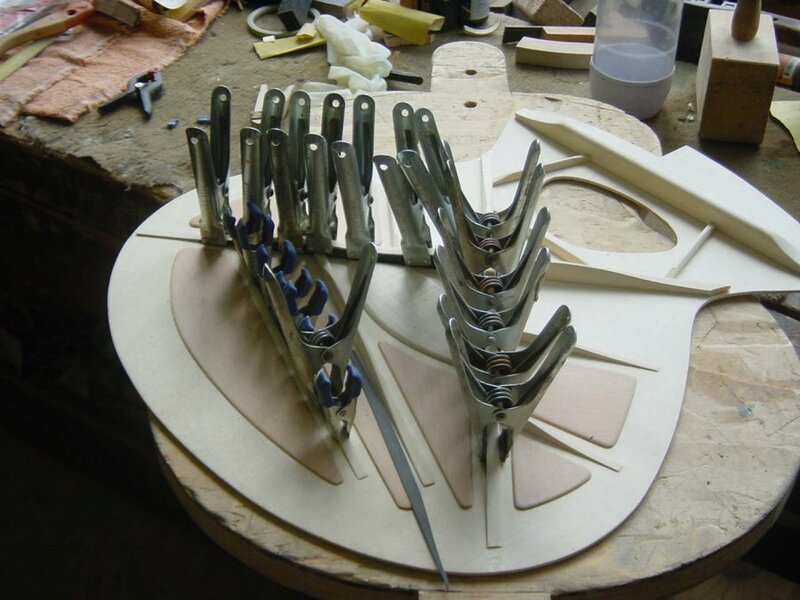 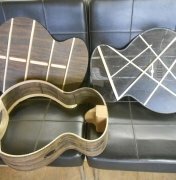 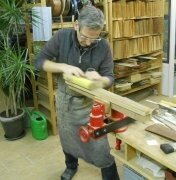 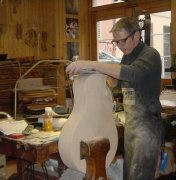 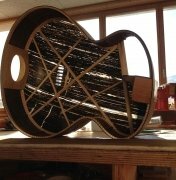 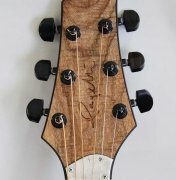 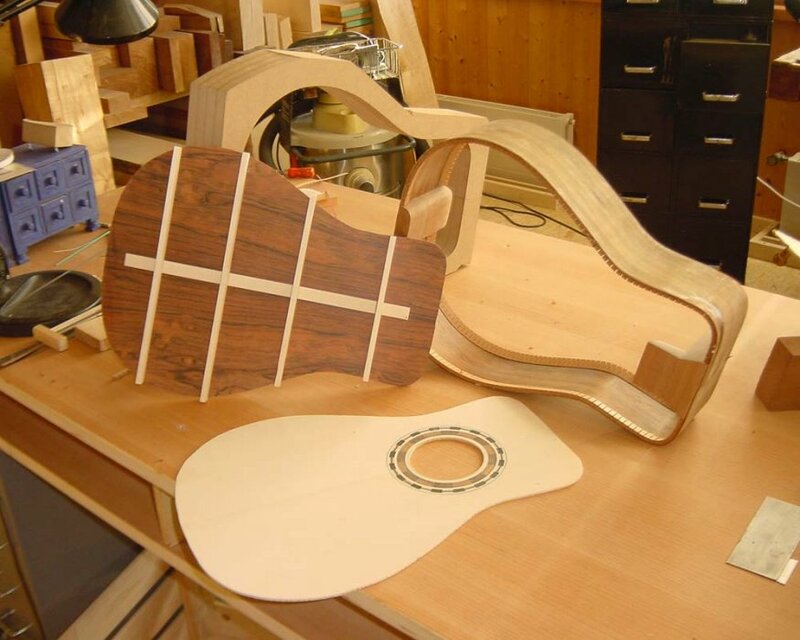 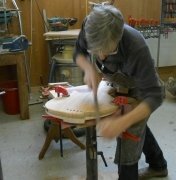 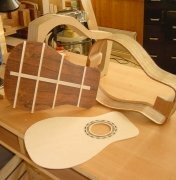 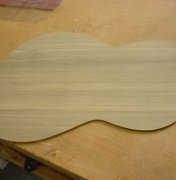 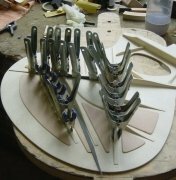 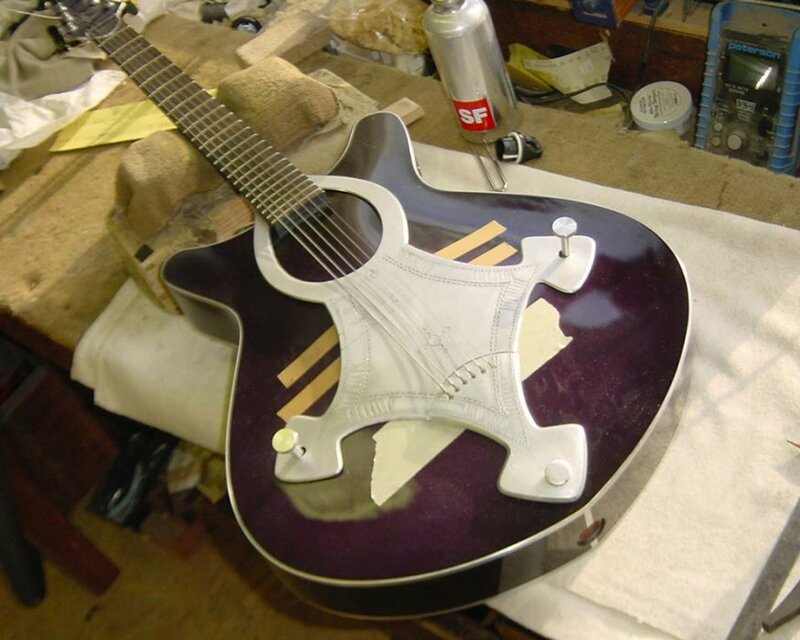 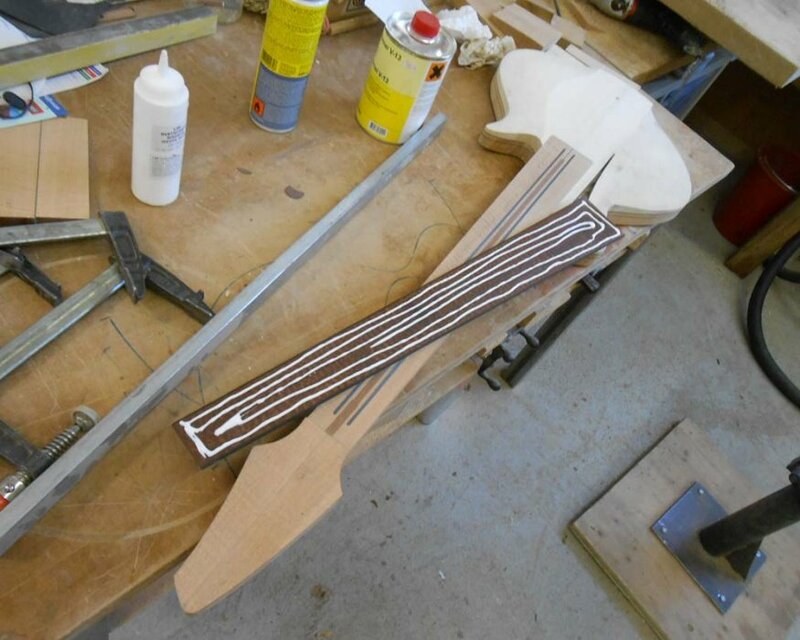 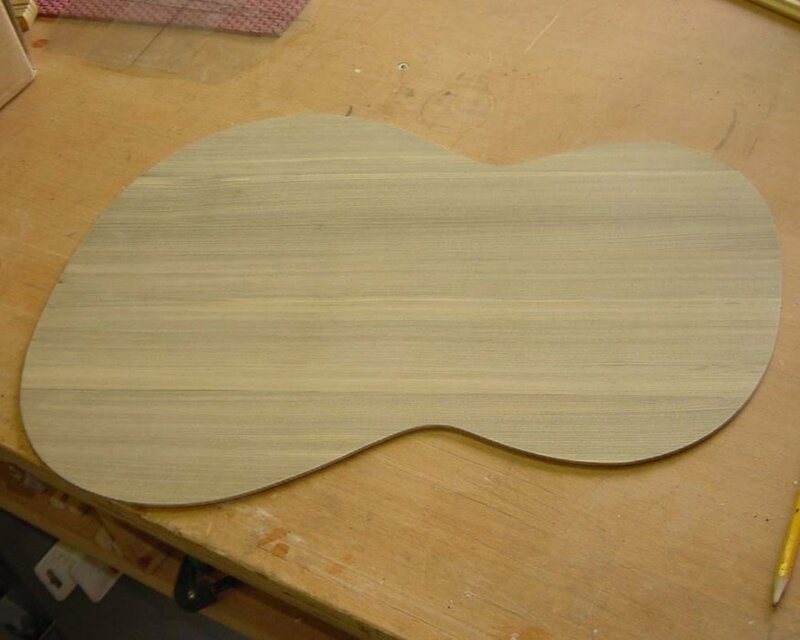 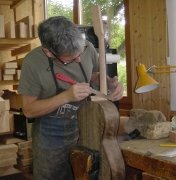 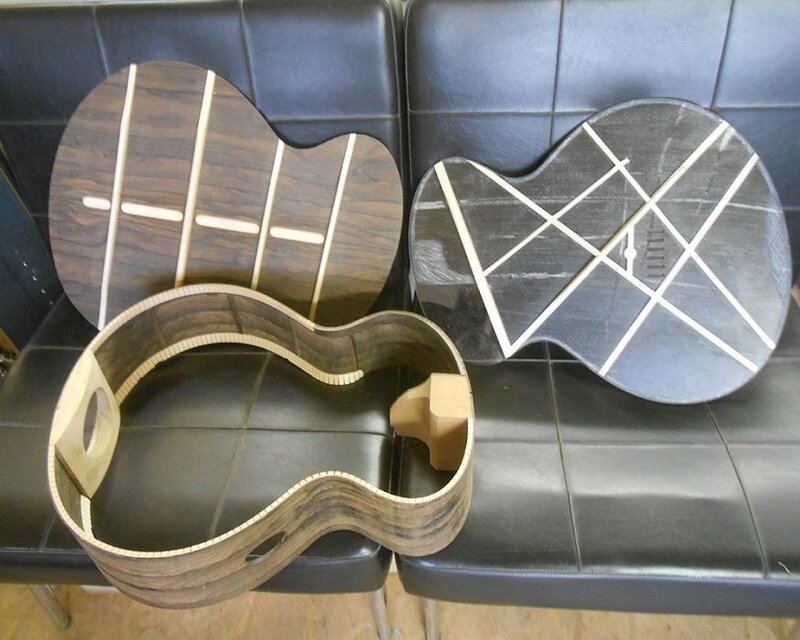 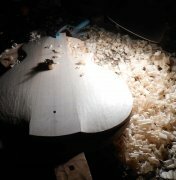 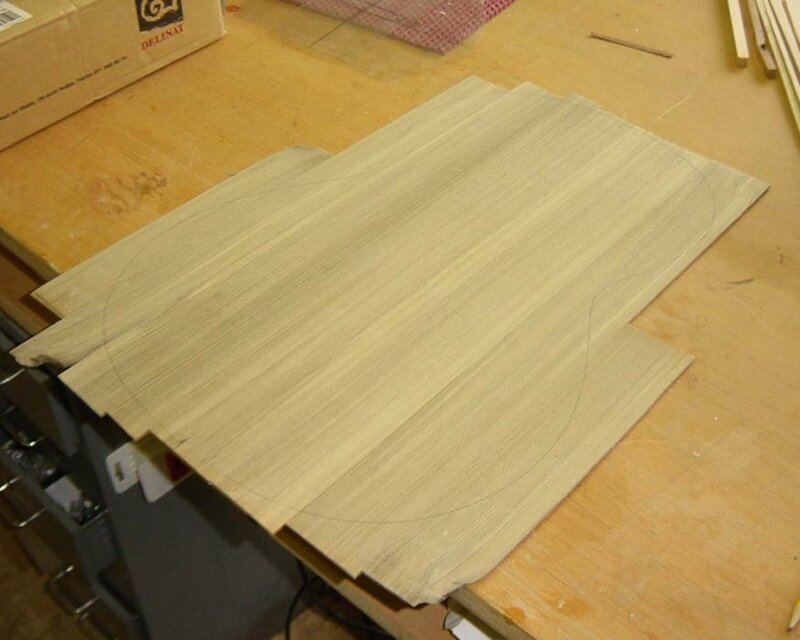 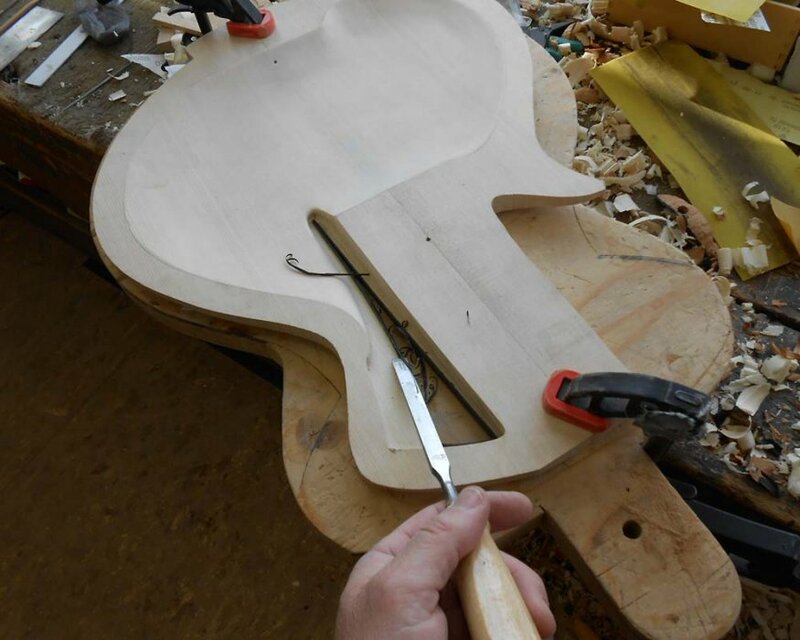 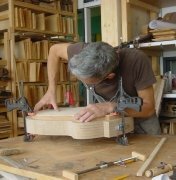 One of the unusual aspects about the guitar is its top construction. 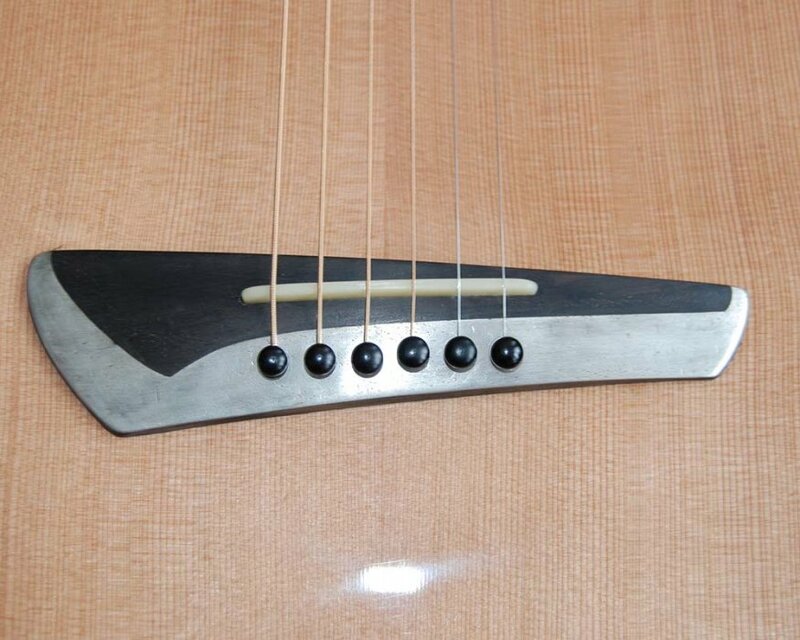 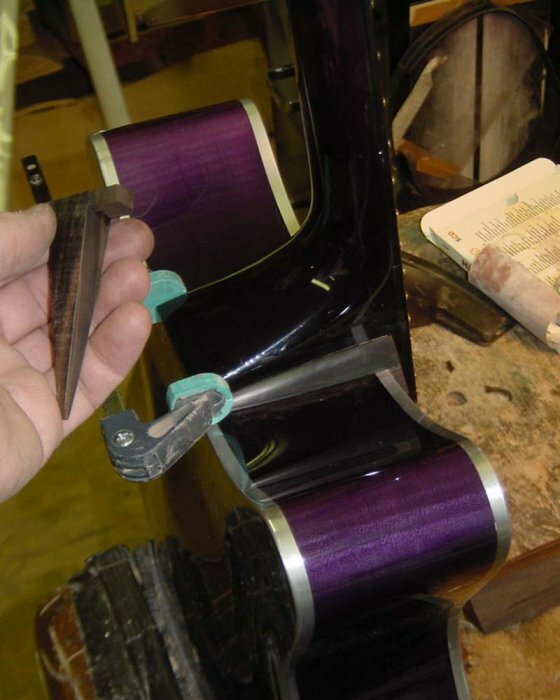 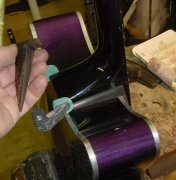 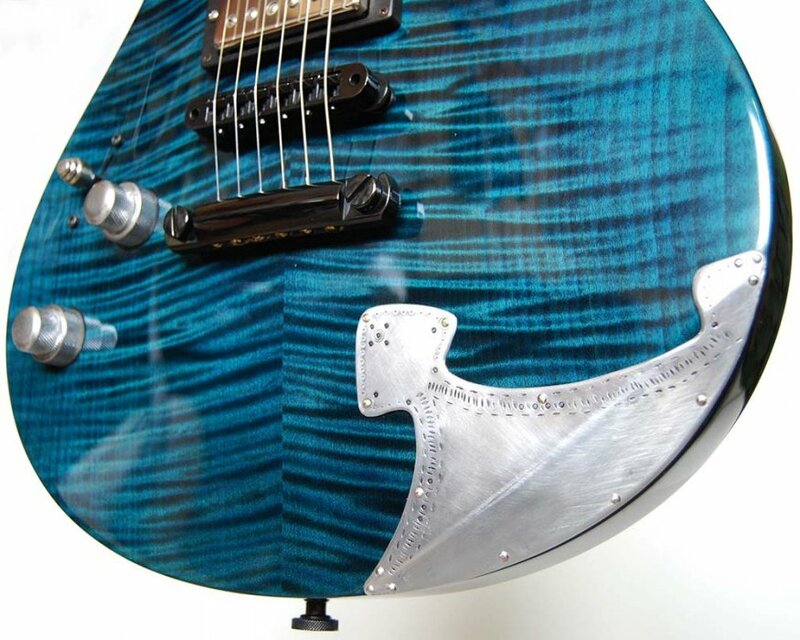 In order to have better control over the guitar’s low-end, we reinforced the top braces with carbon-fiber. 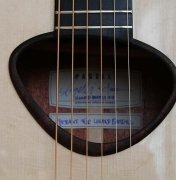 Although this takes away some of the bass when playing acoustically, the resulting tone has excellent definition on stage or in the studio, and it also ends up being a better compliment to Linard’s singing voice. 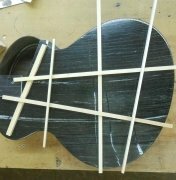 We also used «pads» to further reinforce the top. 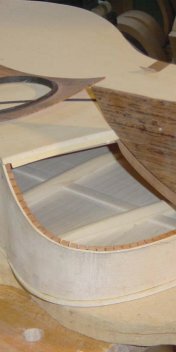 These are pieces of spruce that are glued in-between the braces, across the top’s grain. 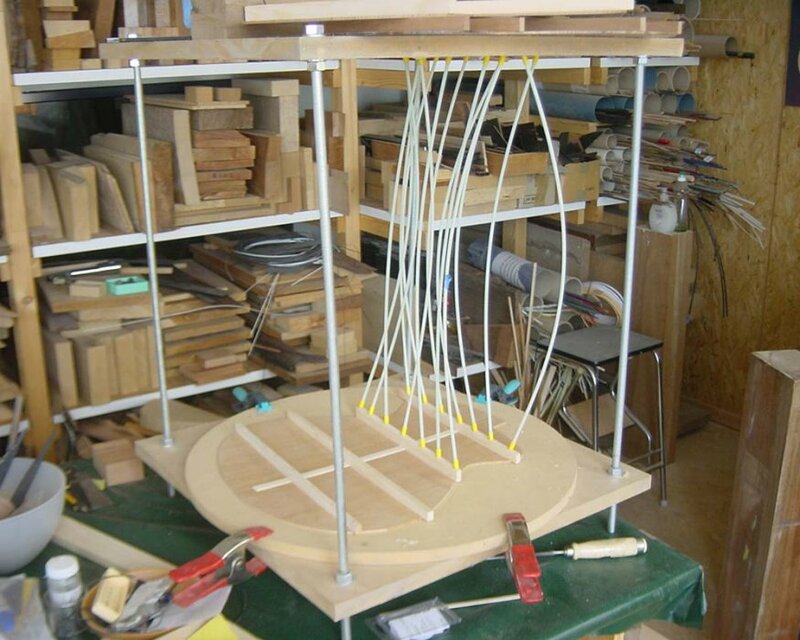 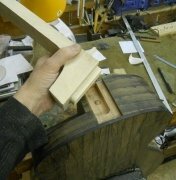 The idea is to stabilize the top as a whole without increasing its thickness. 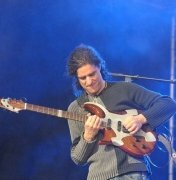 The best part is that both reinforcing measures are reversible, so that if Linard ever decides that he doesn’t want to use the guitar on stage anymore, we could take them out, and by doing so increase the guitars low-end and response. 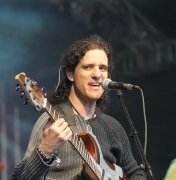 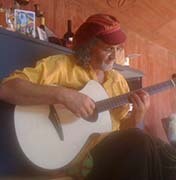 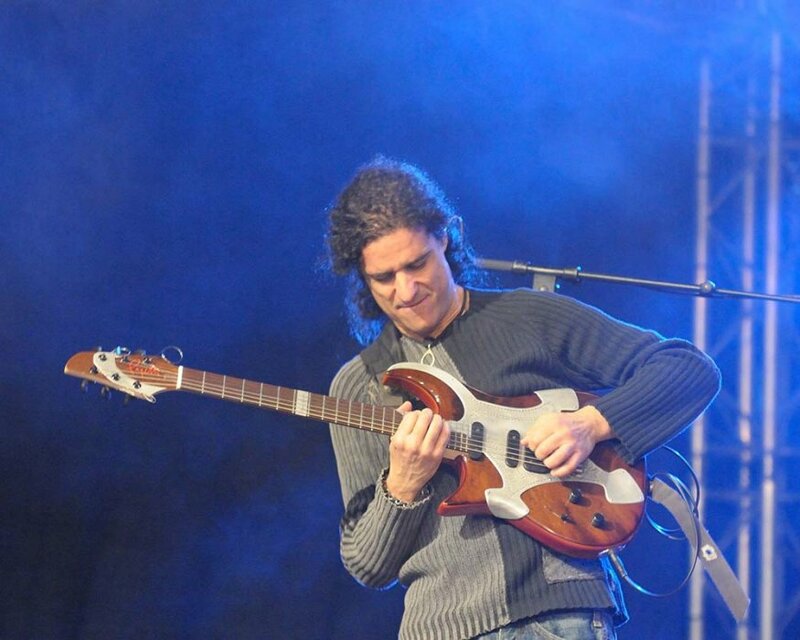 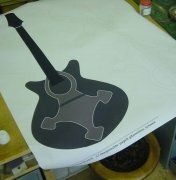 But for now, the guitar is perfect as it is, and of course we hope that Linard won’t stop playing live for a long time! 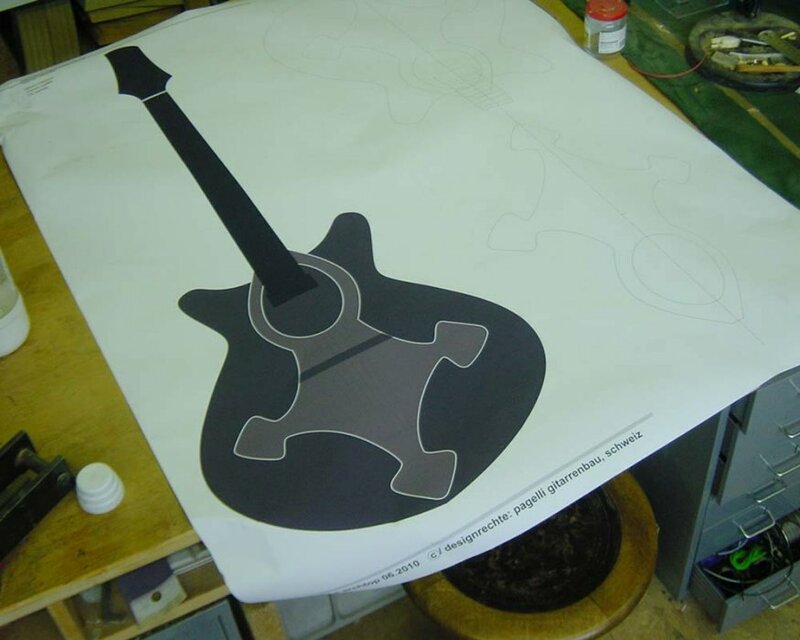 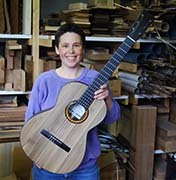 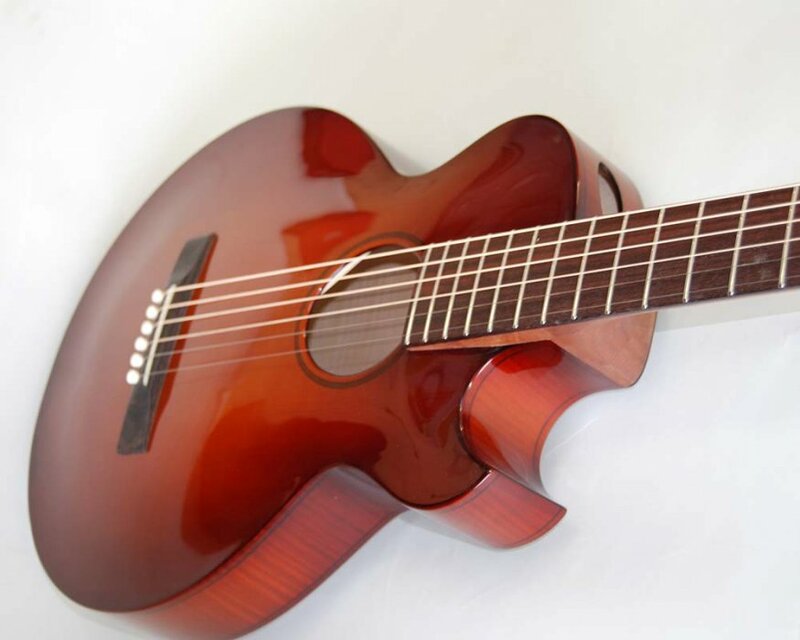 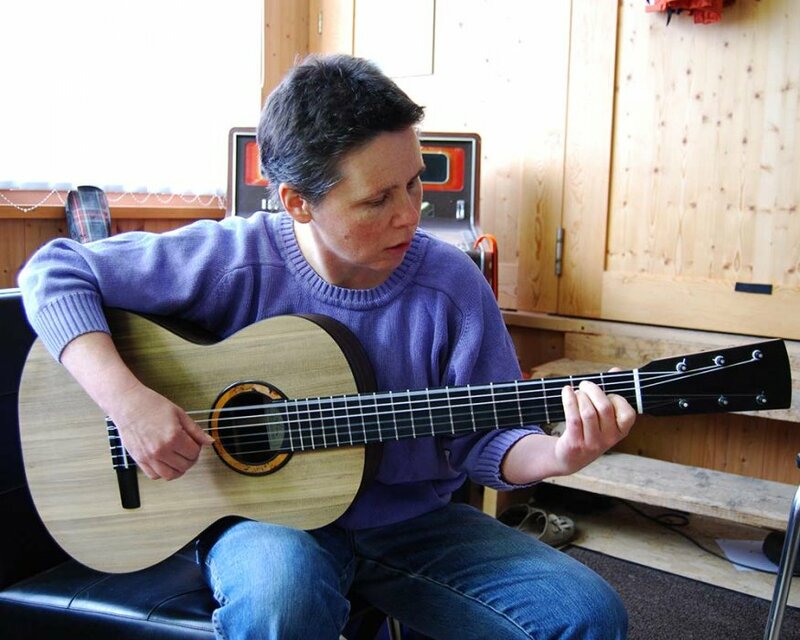 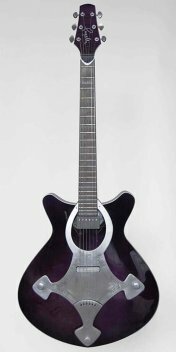 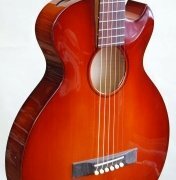 The guitar’s design has a feminine quality, as the tonal requirements meant we had to build it somewhat petite. 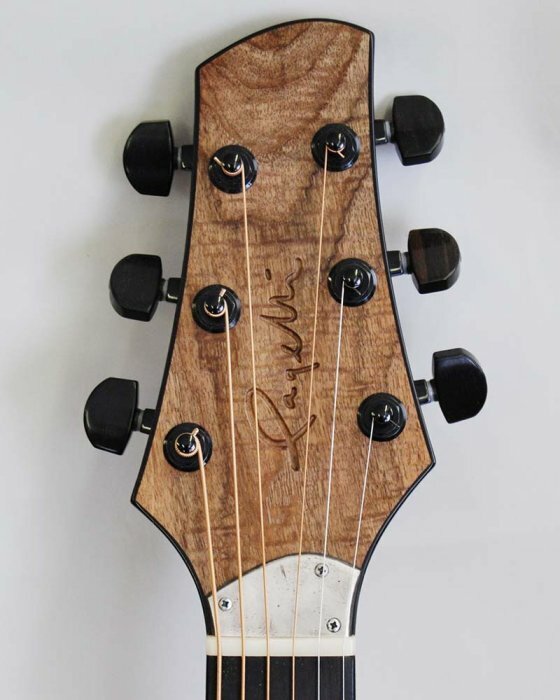 We built these three guitars for Djamel Laroussi, a great guitarist who is a major star in his native Algeria, and who has played with Stevie Wonder, among others. 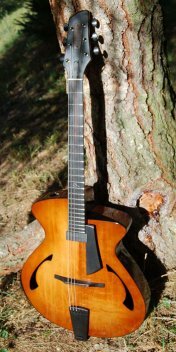 The first guitar was a Strat-like guitar, then we moved on to a Les Paul-ish design, and finally arrived at the archtop. 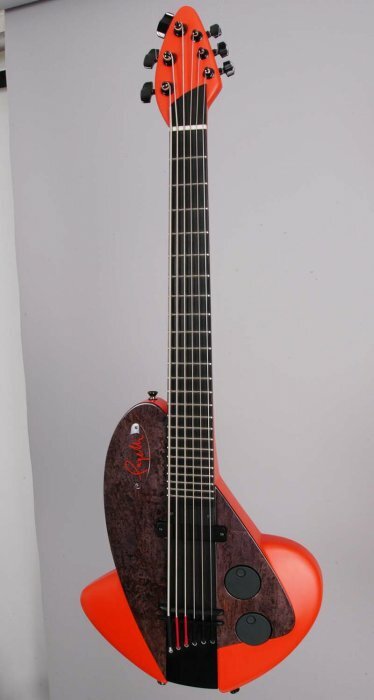 Besides having very specific ideas about neck dimensions, sound, and playability. 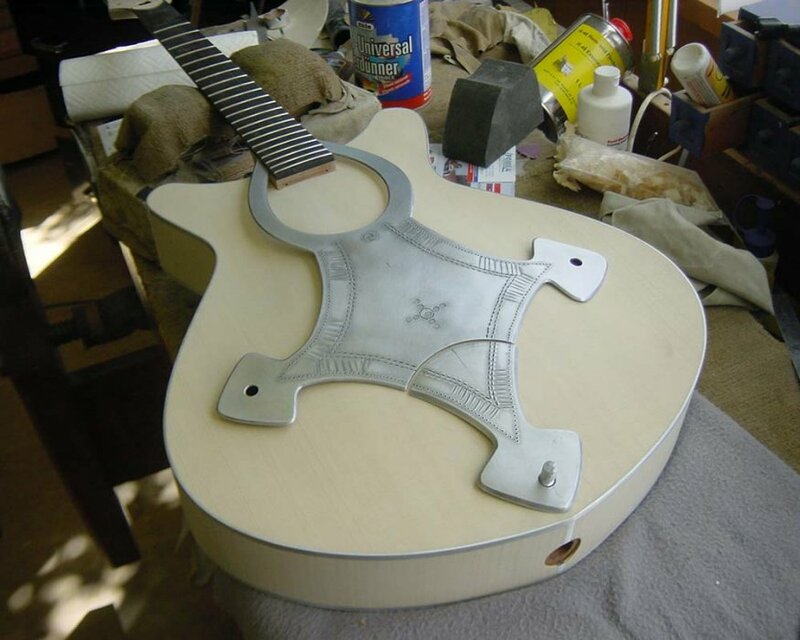 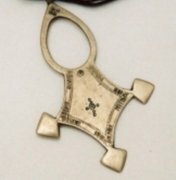 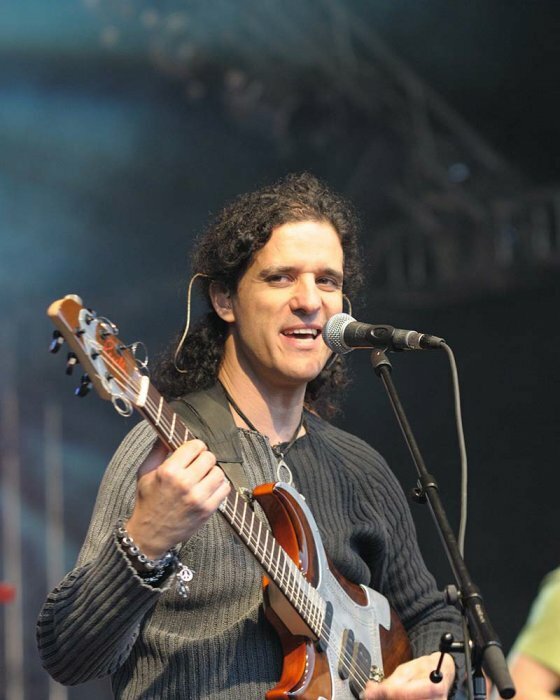 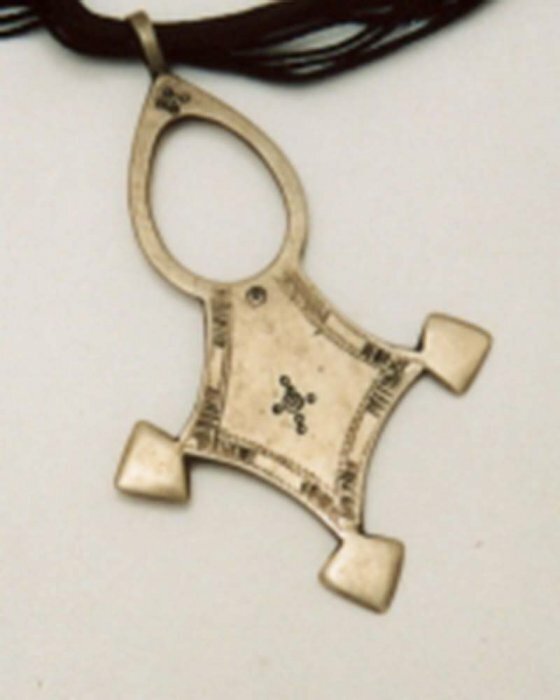 Djamel insisted that the guitars needed to include the traditional Tuareg cross symbol in their design. 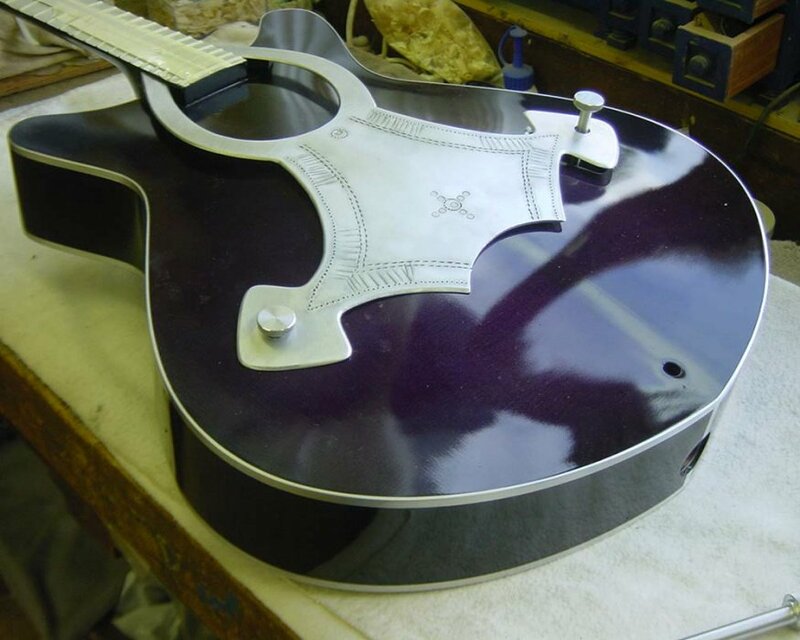 Copying a pendant he wears on a necklace, we chose to hammer our versions from metal, giving it a rough-edged look that provides a beautiful contrast to the smooth finish and otherwise high-end fit-and-finish of the guitars, while at the same time symbolizing Djamel’s constant movement between African and European cultures. 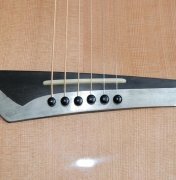 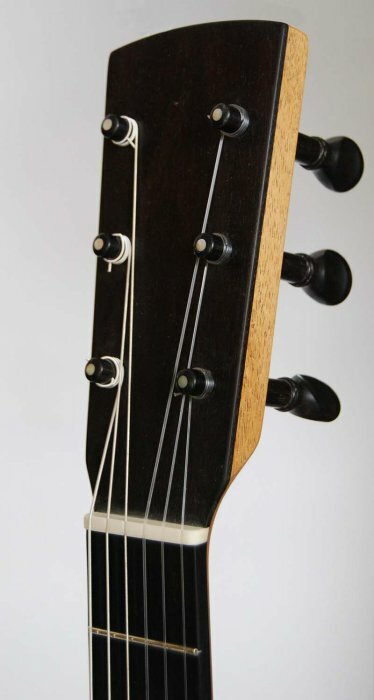 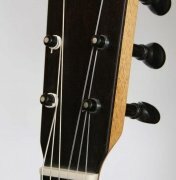 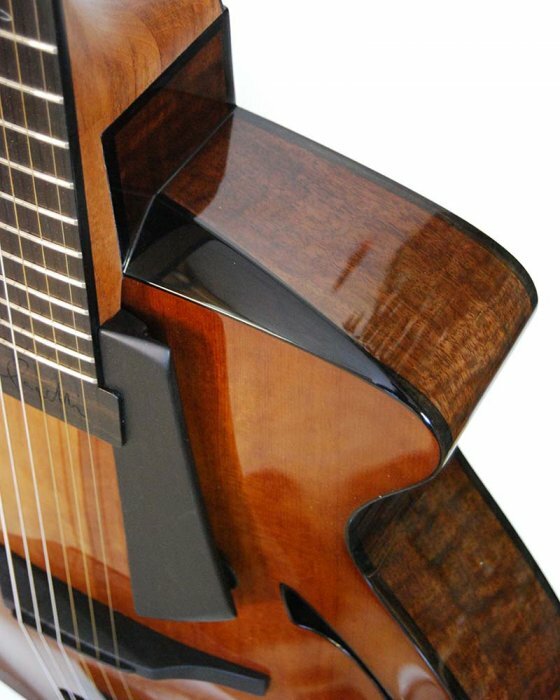 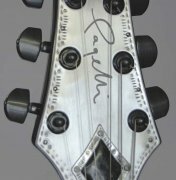 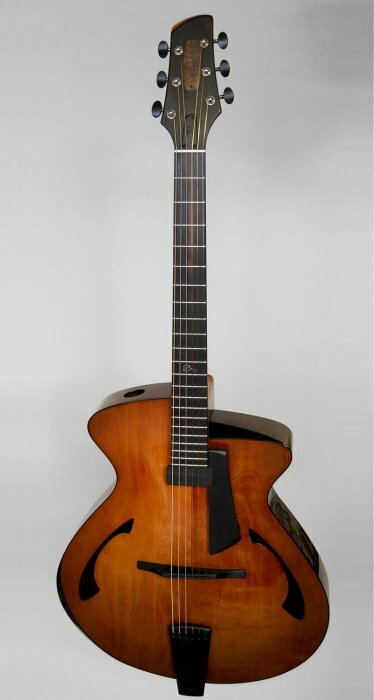 On the archtop, the Touareg cross even takes on a practical function: Positioned above the f-holes, it can be raised or lowered with a pair of thumb-screws, allowing adjustments to the guitar’s bass response and a complete closure of the holes, which increases the instrument’s ability to be used at high volumes without feeding back (see section on innovations). 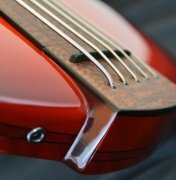 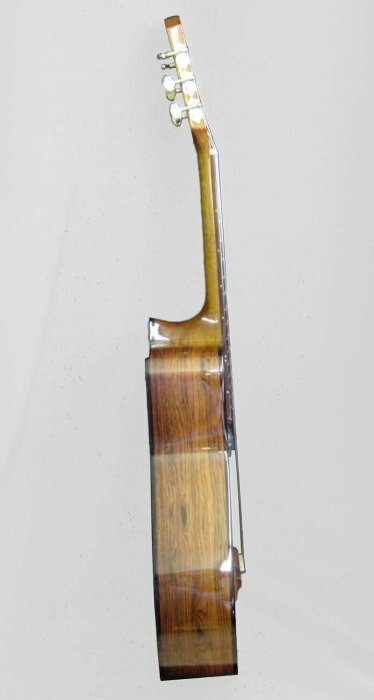 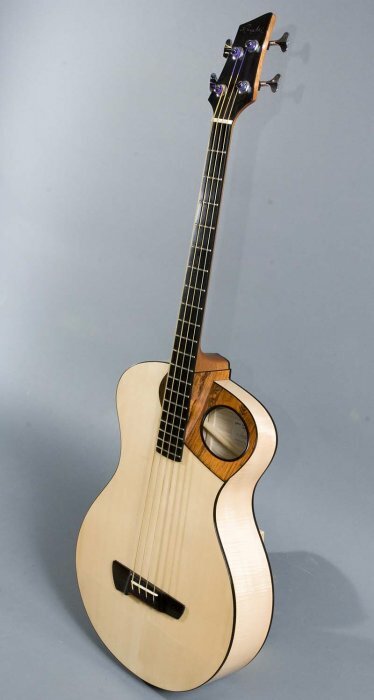 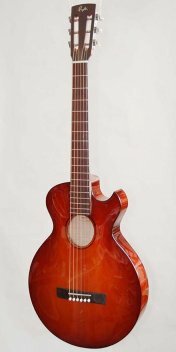 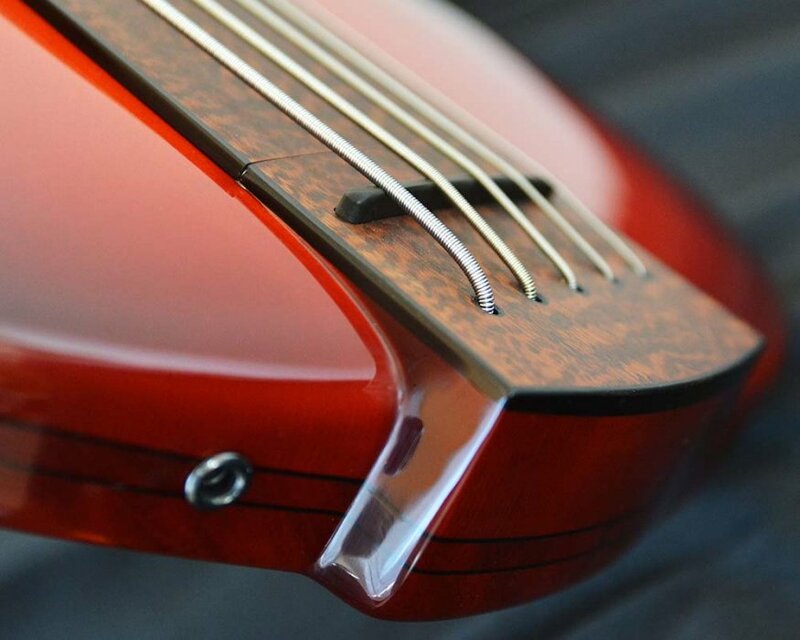 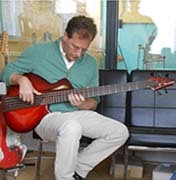 Acoustic basses have a tendency to sound thin, often lacking volume and low-end. 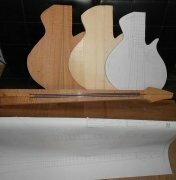 The logical solution is to make them very big, but what else can be done? 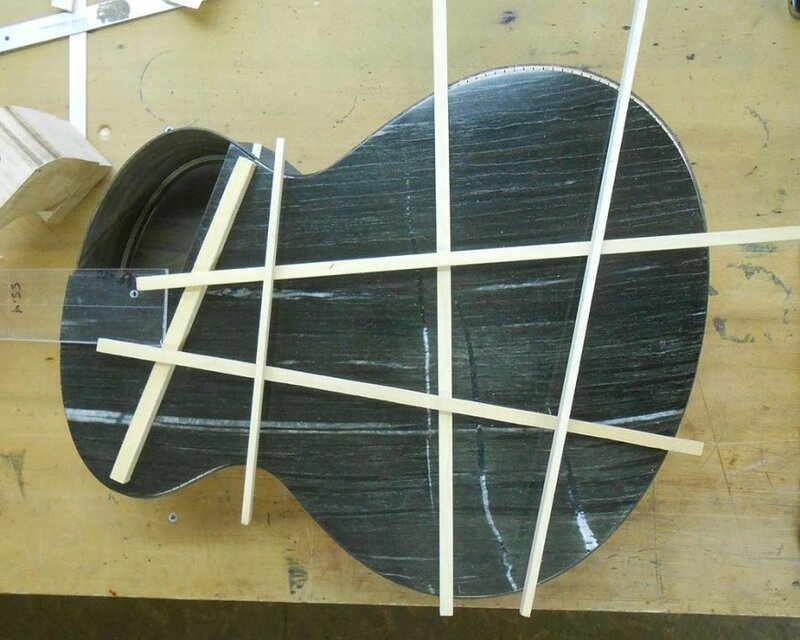 That was the question leading us to the construction of this instrument. 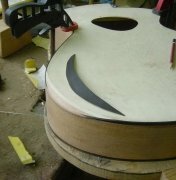 We knew we needed a large top surface to move as much air as possible, so we figured that we’d move the soundhole away from the traditional centered position. 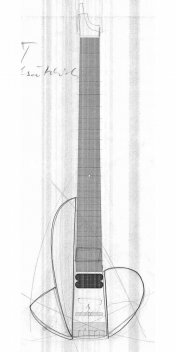 But Thomas wanted a cutaway, which threatened to take away some the precious body volume. 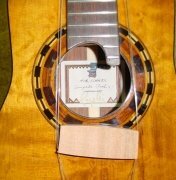 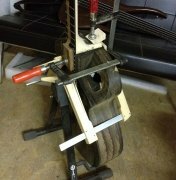 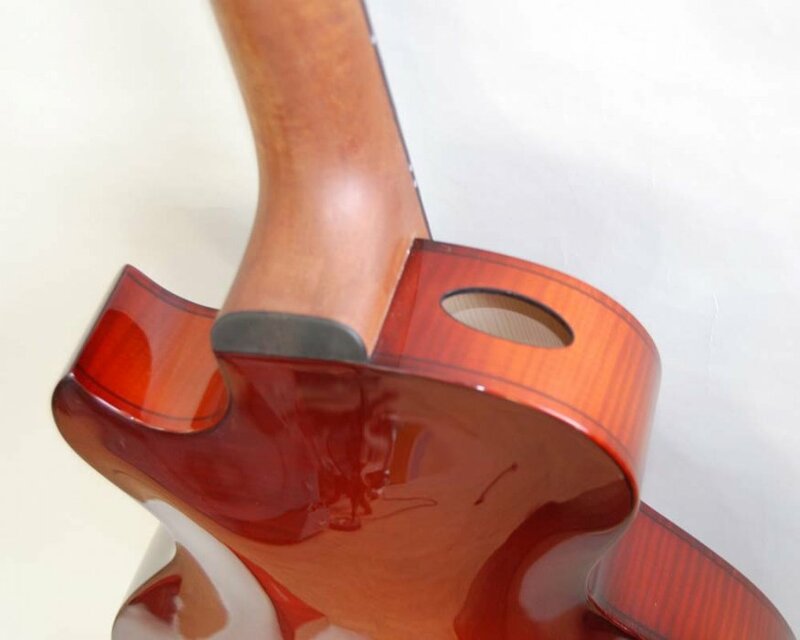 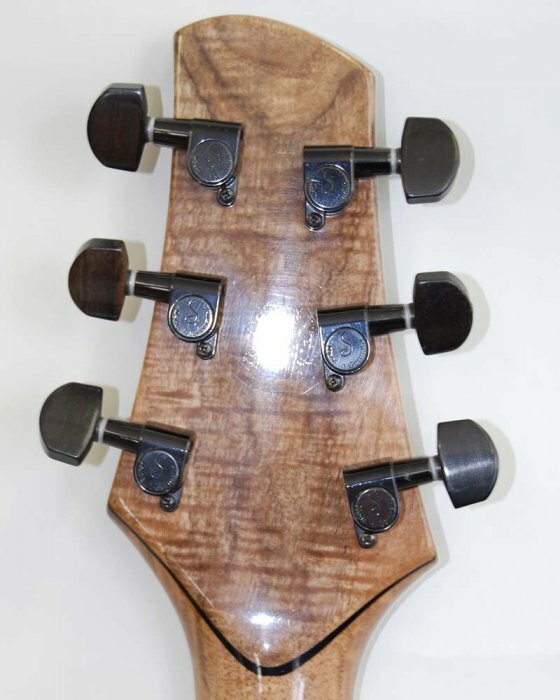 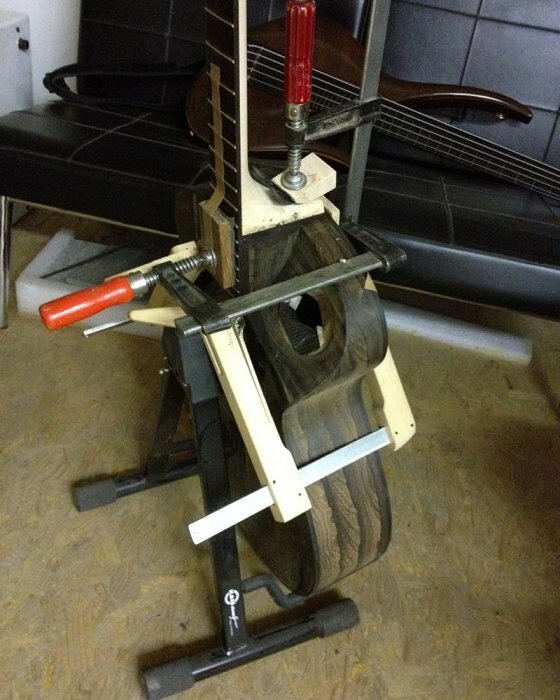 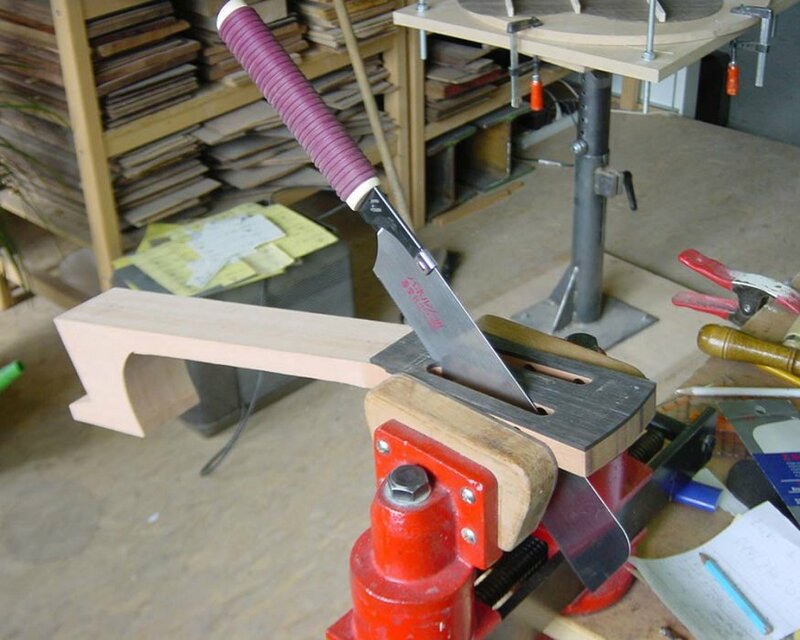 Our solution was to invent our «Top Cut», which slopes down the treble side of the upper bout, results in cutaway-like access to the higher frets without taking away internal body space. 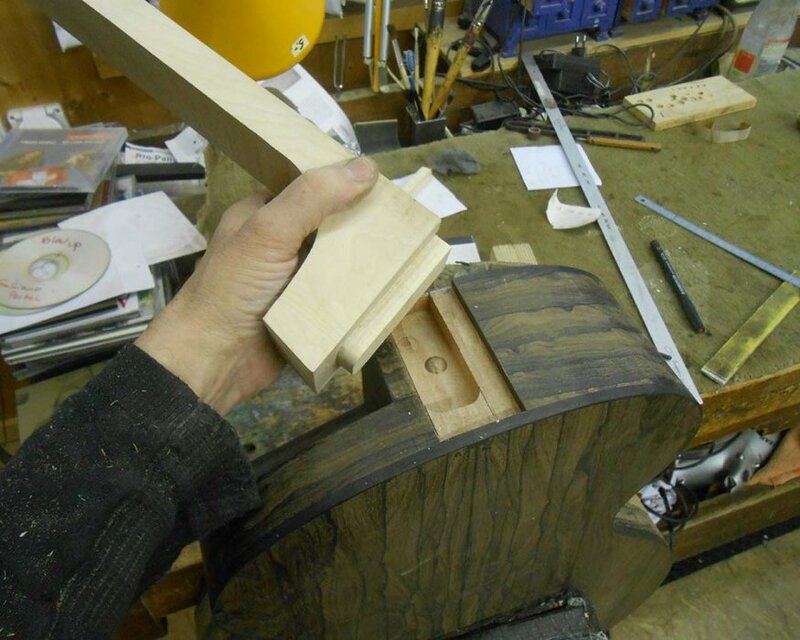 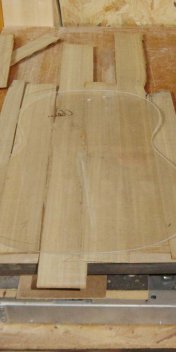 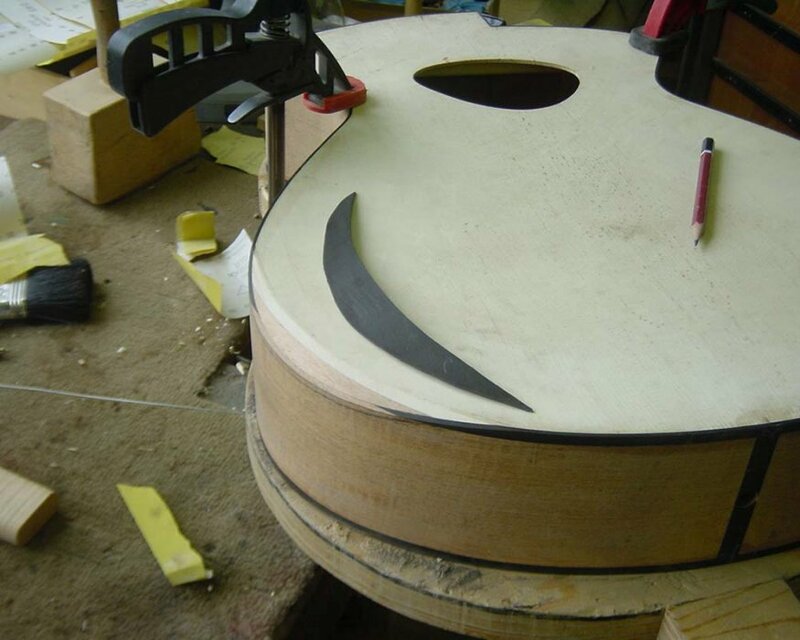 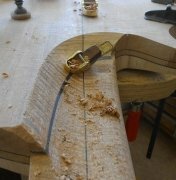 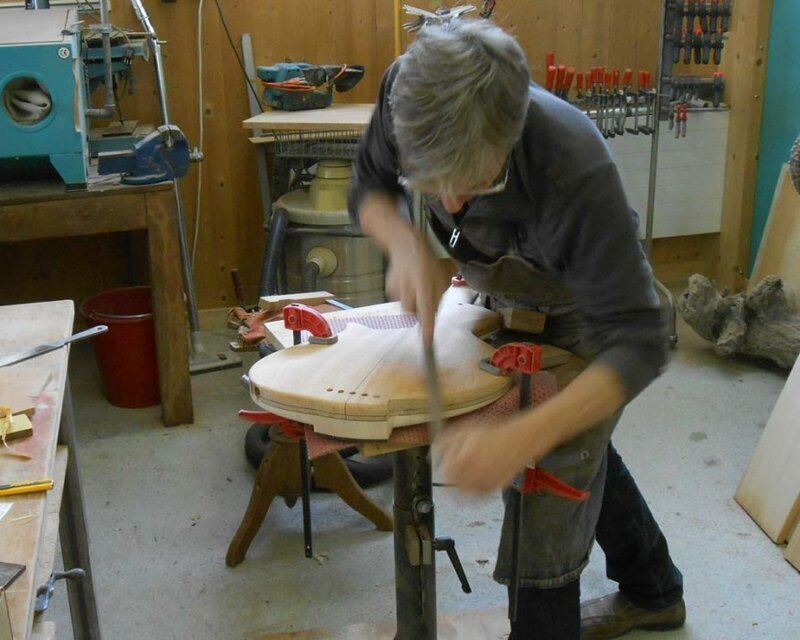 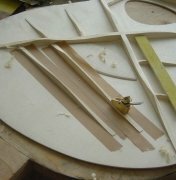 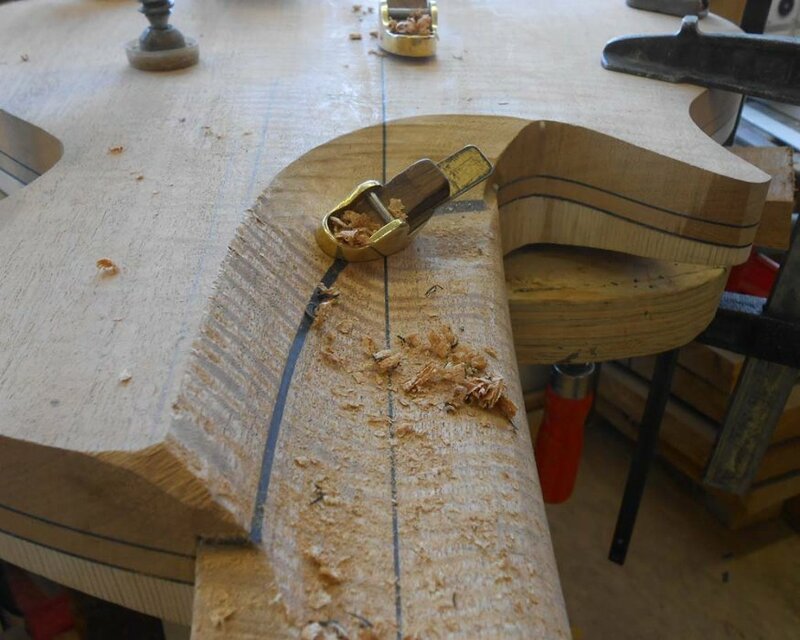 We then placed the soundhole right there into the sloped top section, solving multiple chellenges in one strike. 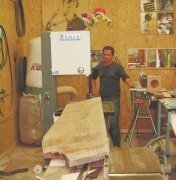 Check out the «innovations» section for more information on the Top Cut. 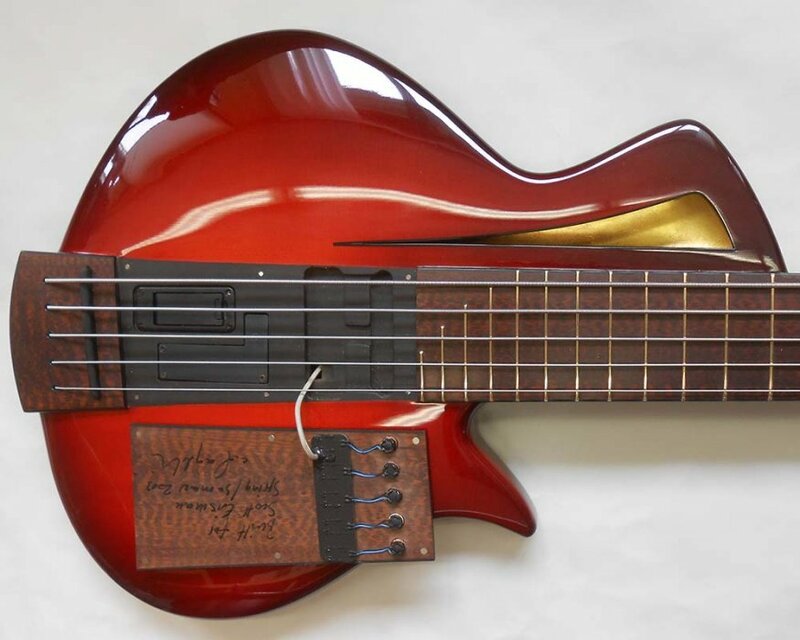 Oh yes, and the bass really does sound full and warm! 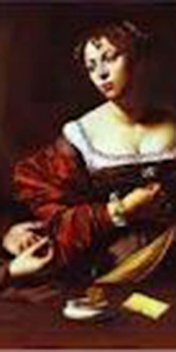 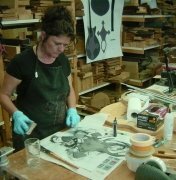 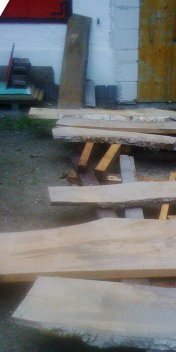 Ms. von Blarer got in touch with us because she owned the oldest piece of spruce that was ever found in Switzerland; it was from 2500 BC! 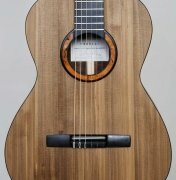 OK, so this was exciting - what kind of sound would this spruce have? 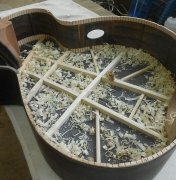 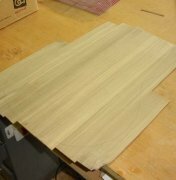 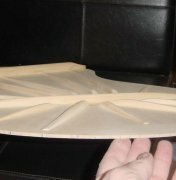 Unfortunately, the piece was fairly small, so we had to cut it into strips and build the top out of ten sections that were glued together. 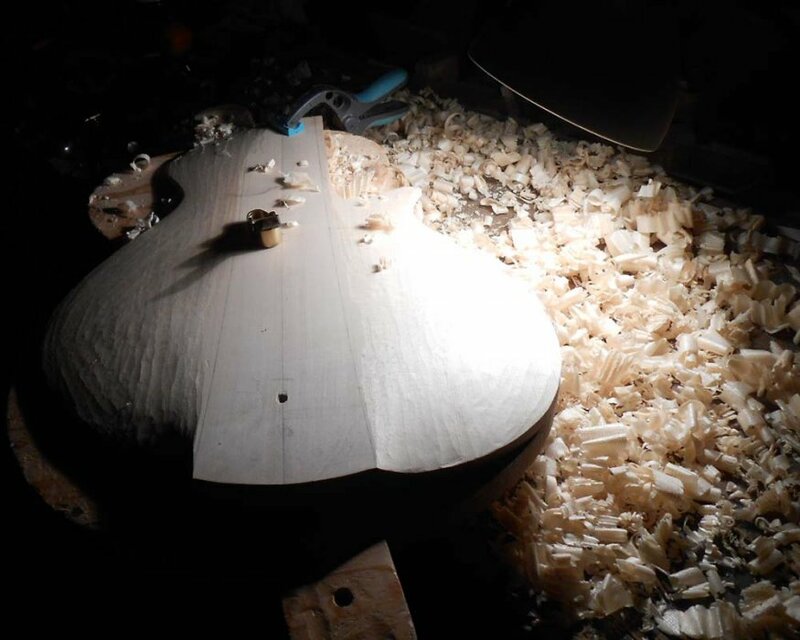 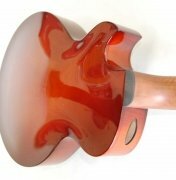 The result had excellent longitudinal stability and a promising tap tone, but was very fragile across the grain. 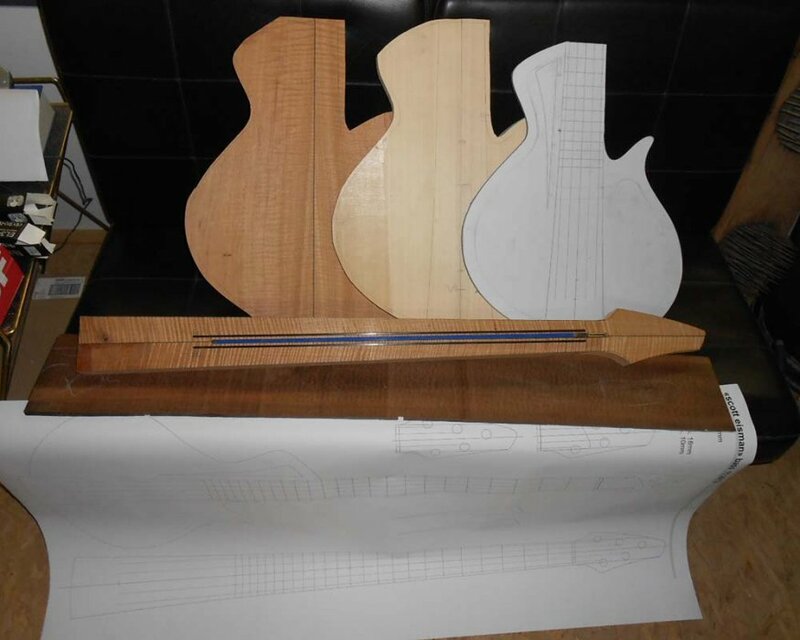 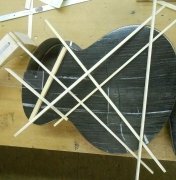 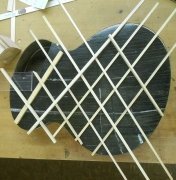 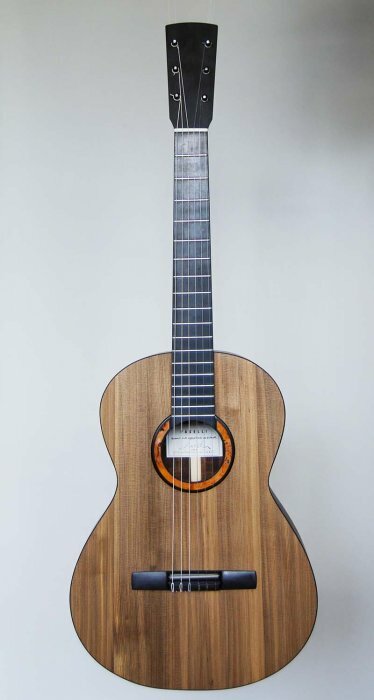 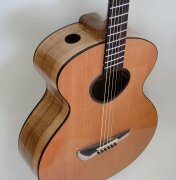 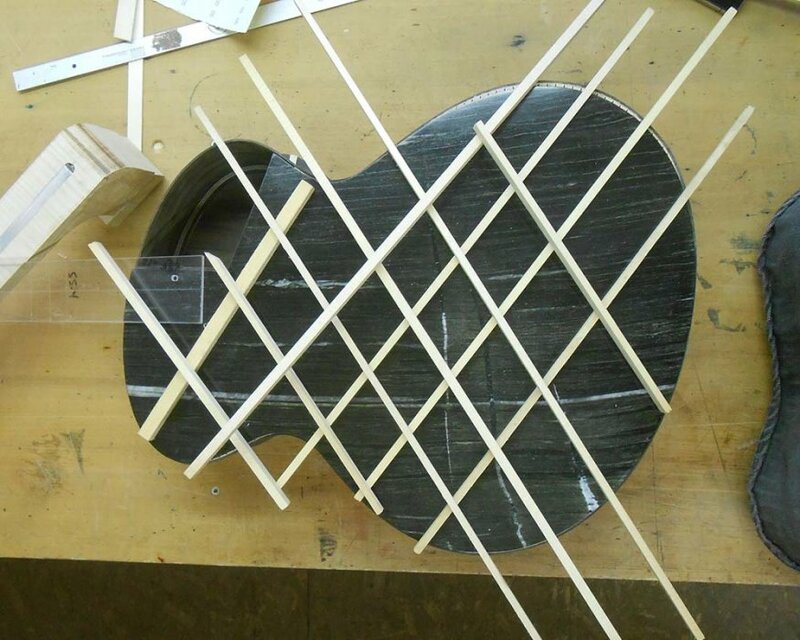 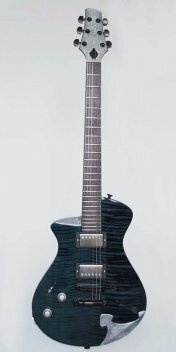 Because von Blarer wanted a classical guitar and I already had several good experiences with using lattice bracing, it made sense to use this design on the guitar, as it would provide both longitudinal and lateral stability. 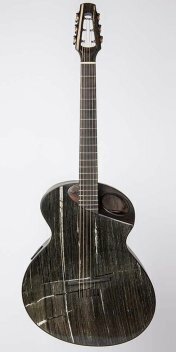 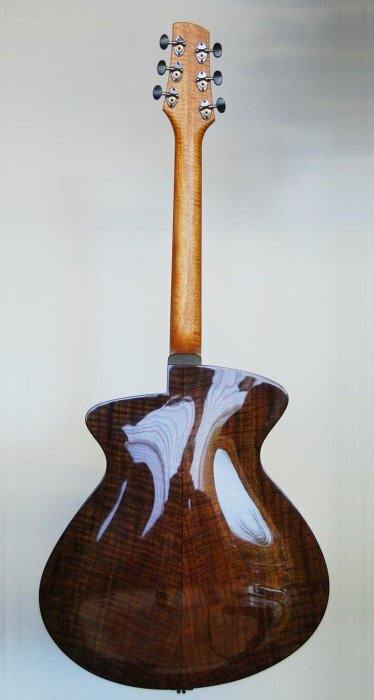 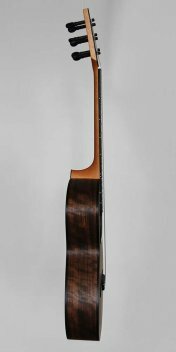 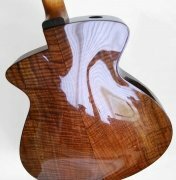 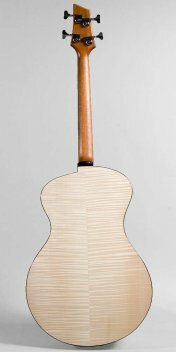 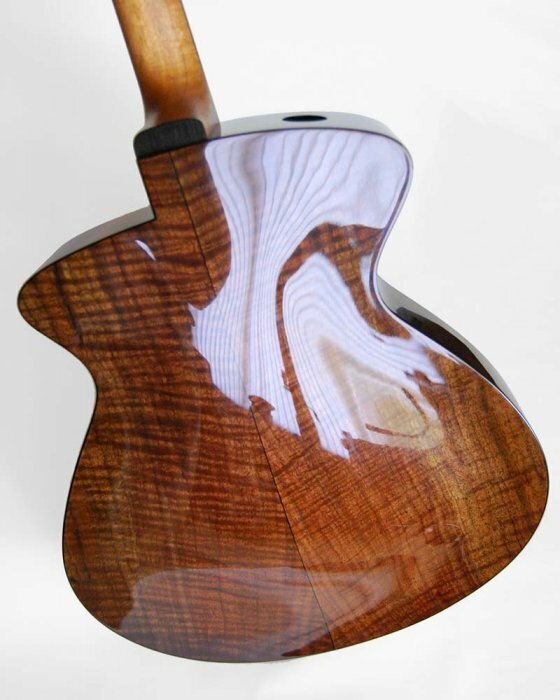 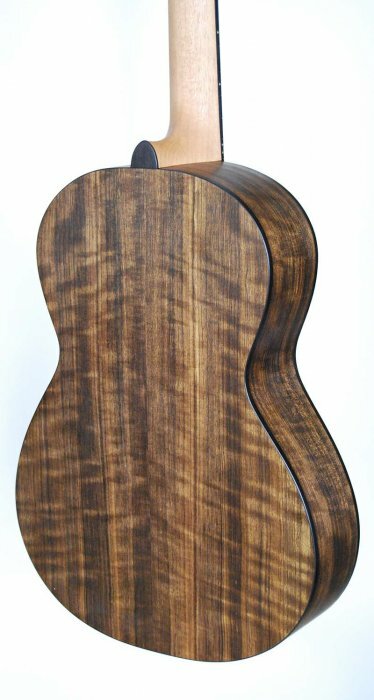 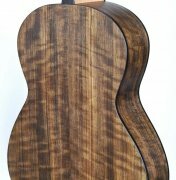 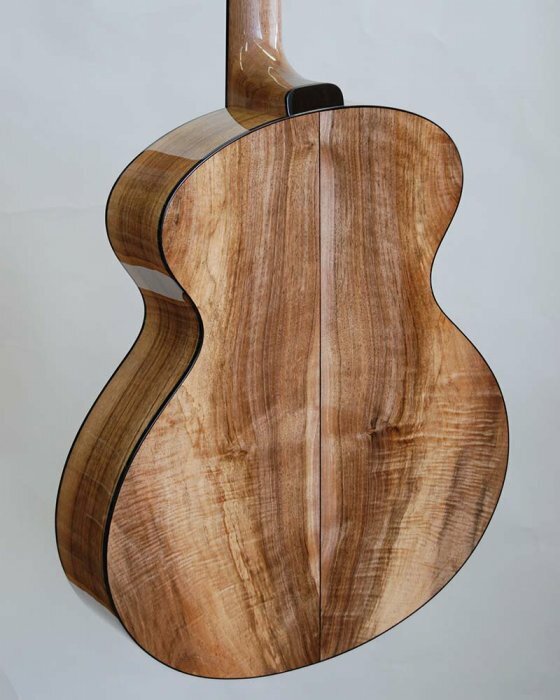 We felt that using ovankol for the guitar’s back and sides would provide a good match for the top’s fundamental tone, and finished the instrument with only a light oil finish, as we didn’t feel that we could cover the one-of-a-kind spruce in lacquer. 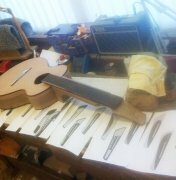 The guitar ended up sounding perfect, with the ancient top woken up to be as lively as school kids on the first day of snow! 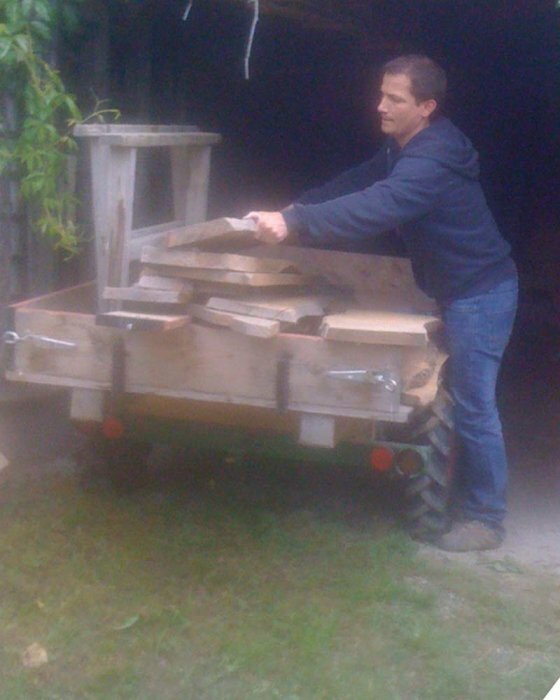 Mr. Patt approached us because he was storing a felled walnut tree behind his house. 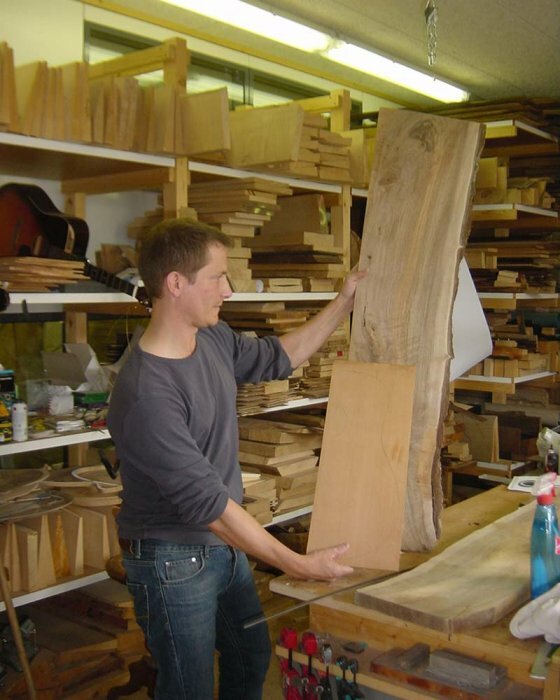 He had a deep connection with this tree, which he climbed on as a child, but which unfortunately had to be cut down. 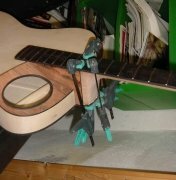 Patt wanted to find a way to honor the tree; perhaps by way of a guitar? 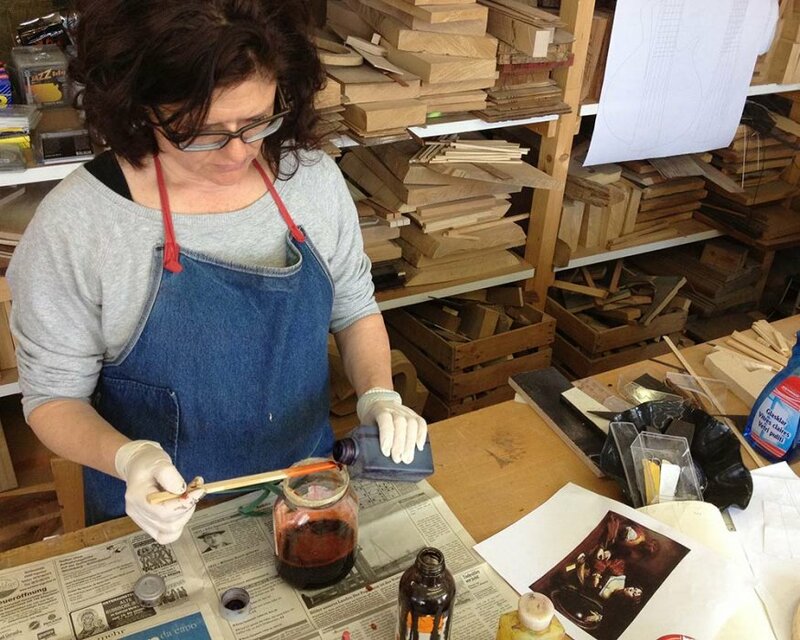 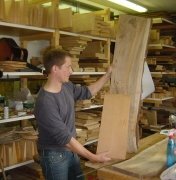 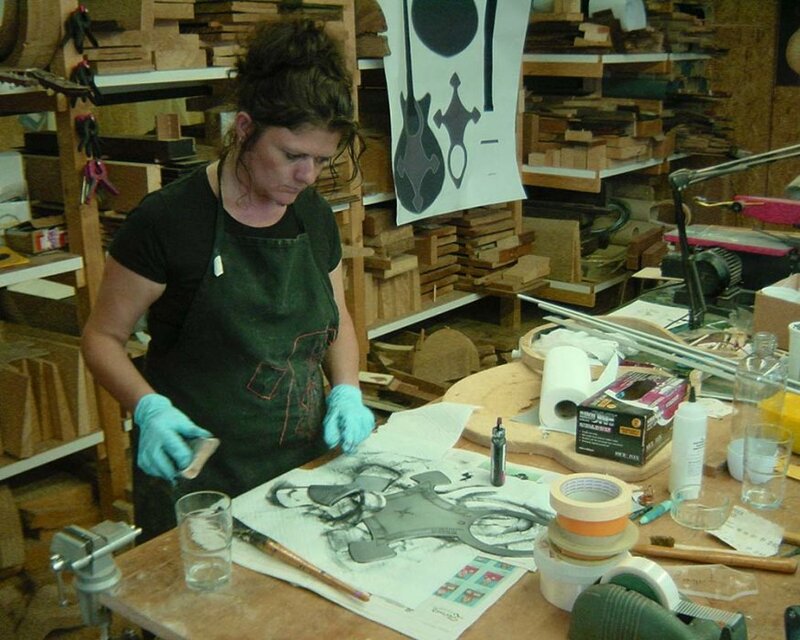 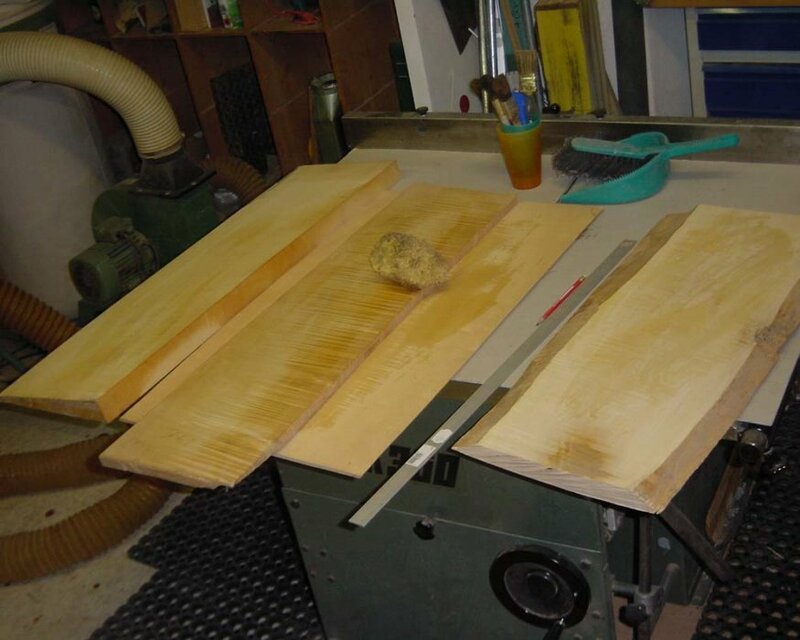 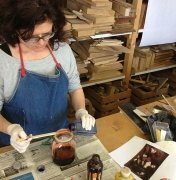 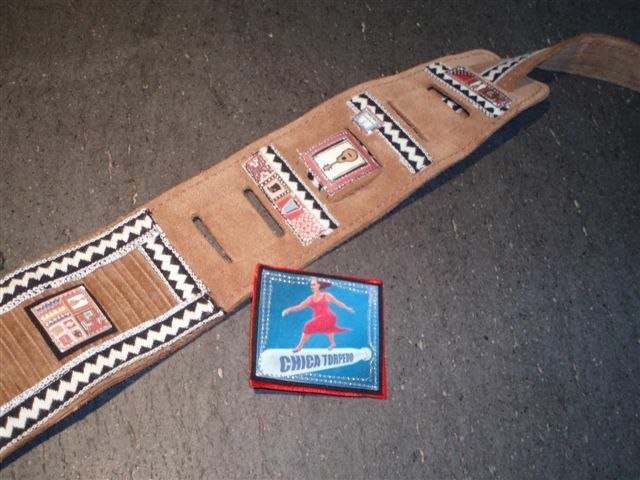 We closely examined the boards, which had already been stored for several decades, and chose the best ones. 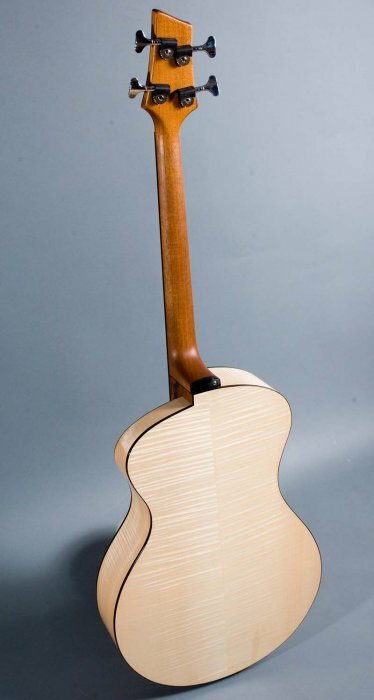 Using the design of our 30th anniversary model as a foundation, we used the wood to build Patt a beautiful guitar with an intimate, warm sound - perfect for paying tribute to his relationship with a special tree! 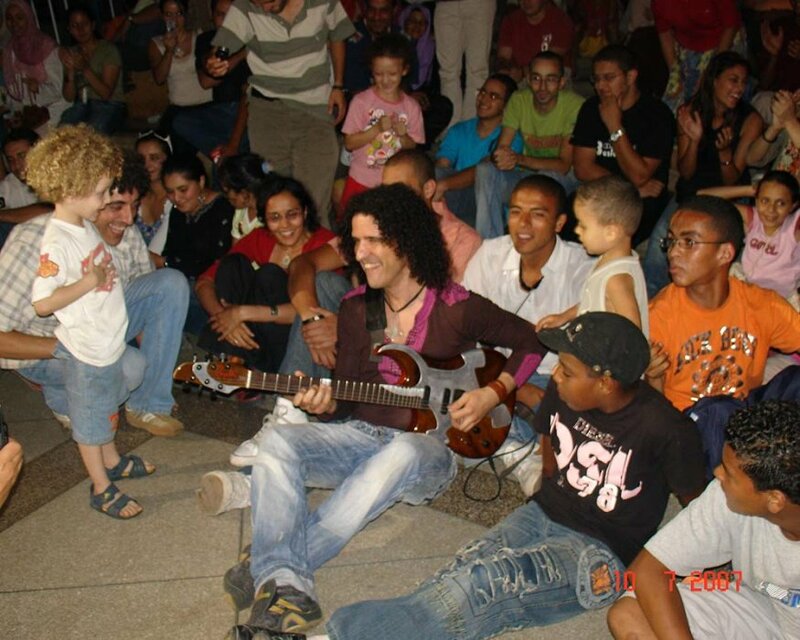 This is the original Massari! 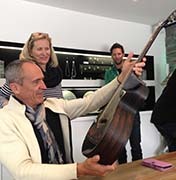 To have a client like famed Swiss architect Res Knuchel is simply a piece of luck. 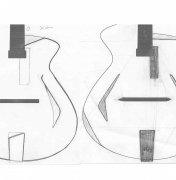 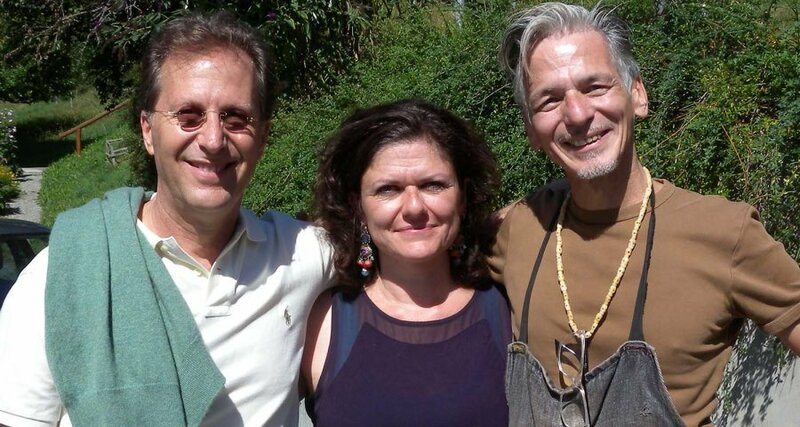 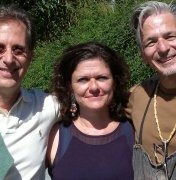 As someone who appreciates beauty and whose job requires an open mindedness toward the new, he collaborated on the blueprint for what became our Massari model. 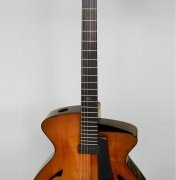 Res wanted an archtop, but not being a traditionalist, he was open to suggestions that were far removed from the mainstream. 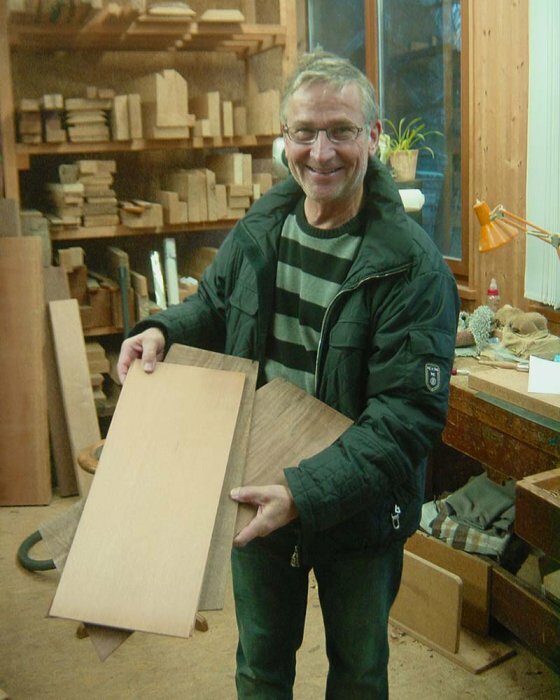 He gave us similar freedom about what wood choices to make. 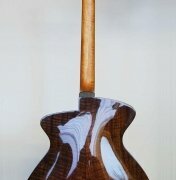 This lead to a body made from very old flamed walnut, using wood that came from a staircase in a St. Moritz hotel! 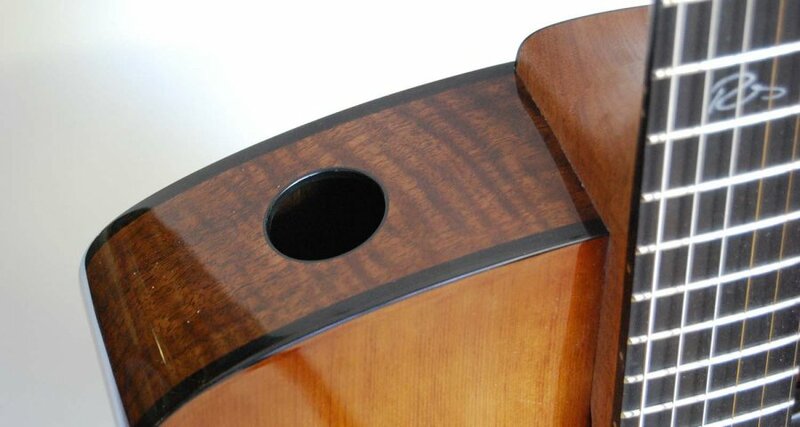 In other words, it could be said that heads of states, famous actors, and great poets have walked on the guitar! 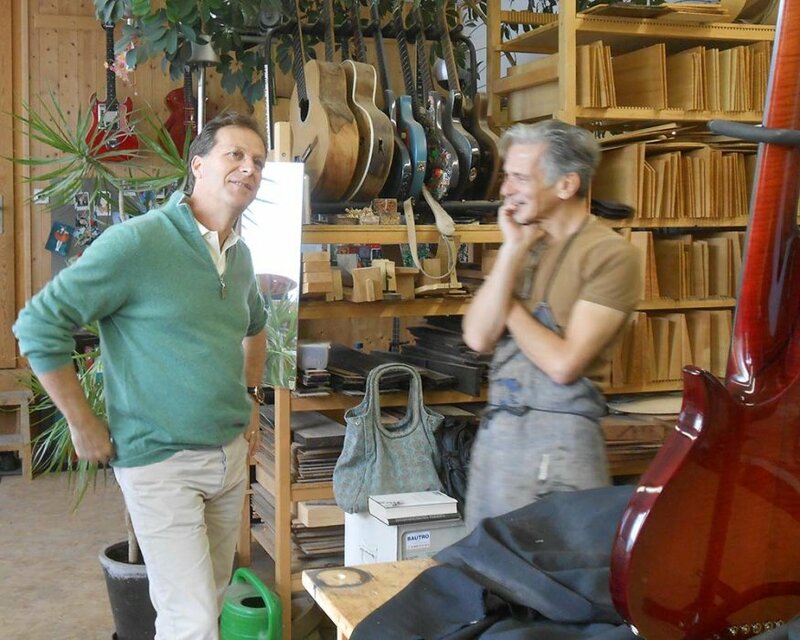 Accordingly, we were happy when he came waltzing into our shop with his 100-year old tres in tow. 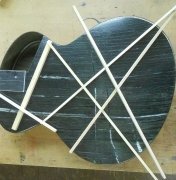 The instrument was holding on by a thread, and he asked us to build an exact copy. 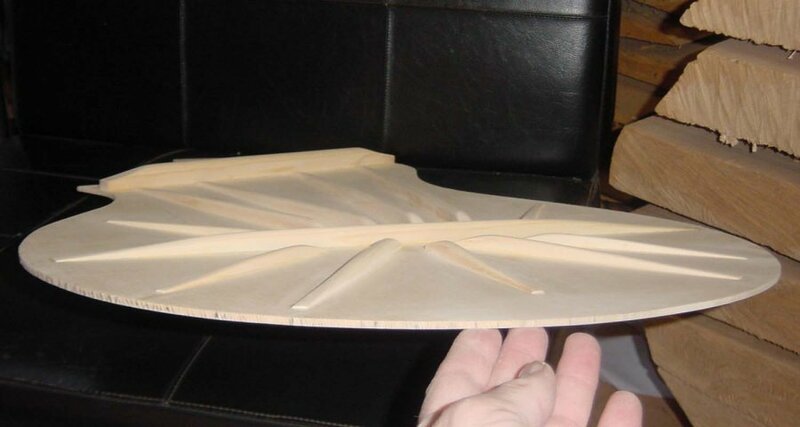 It was fun to make as close of a replica of something as we could for a change. 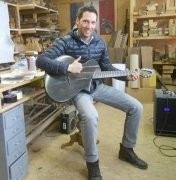 You can’t copy a 100-year old sound, but we came very close, and in some ways, the new instrument’s greater liveliness is actually an advantage over the original. 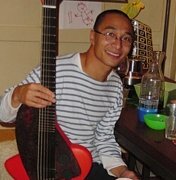 A player like Vieng only exists once - who elese would play a guitar strung with strings as heavy as those on a bass? 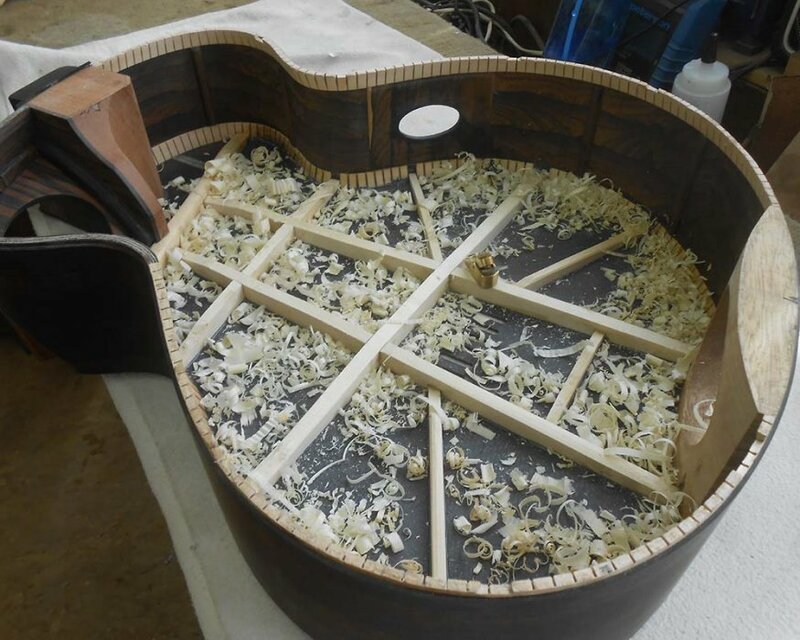 While Vieng’s sound is fatter than anything you’ve ever heard coming from a guitar, he was getting tired of the enormous string tension wearing out the necks on his instruments. 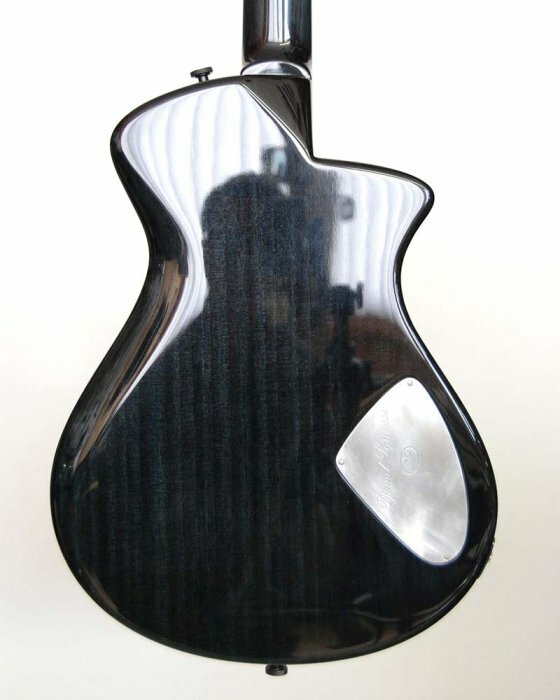 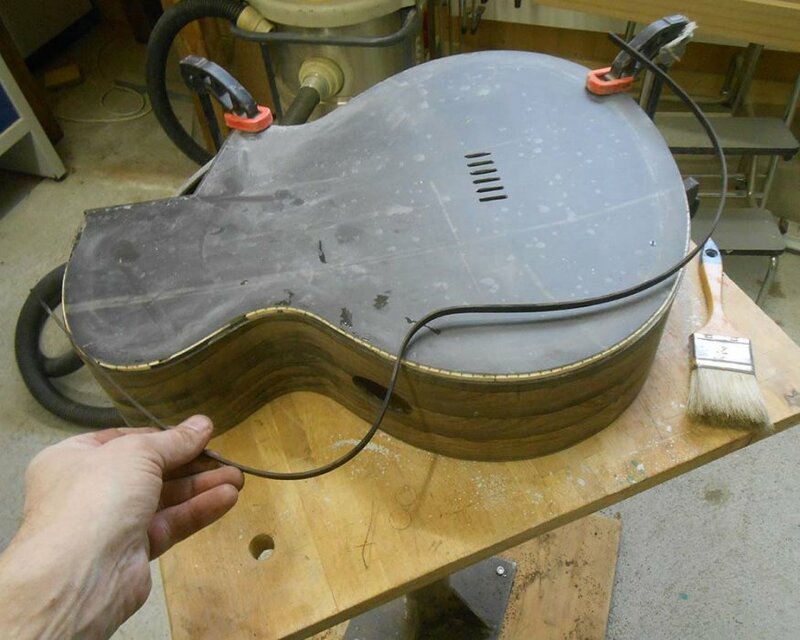 Fortunately, Vieng wanted a chunky neck, which we proceded to reinforce using carbon-fiber. 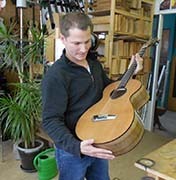 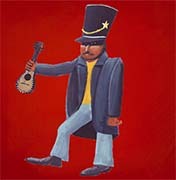 He wanted the instrument to be small, and specified that he only plays standing up. 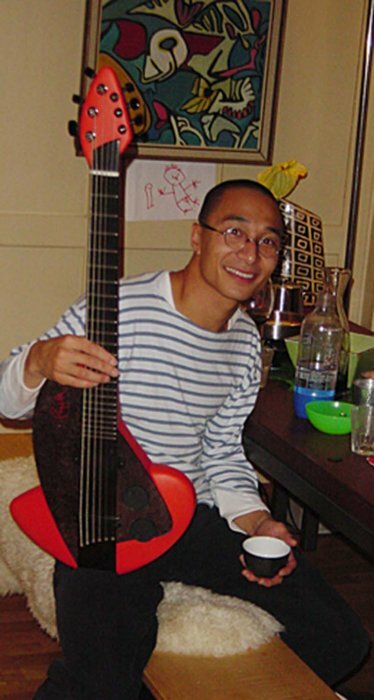 Vieng also wanted to somehow intergrate his experience of being a refugee into the design of the instrument. 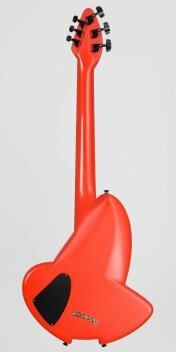 What we came up with was to use the body design (which is perfectly matched to fit Vieng’s playing posture) to symbolize a ship’s sail, the bud of a flower, flight, and a new beginning. 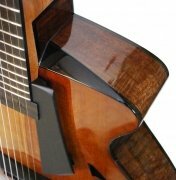 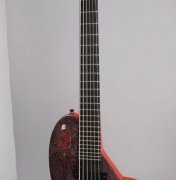 If you don’t know about Vieng’s background, then it is simply a very exciting, polarizing guitar that sound amazing. 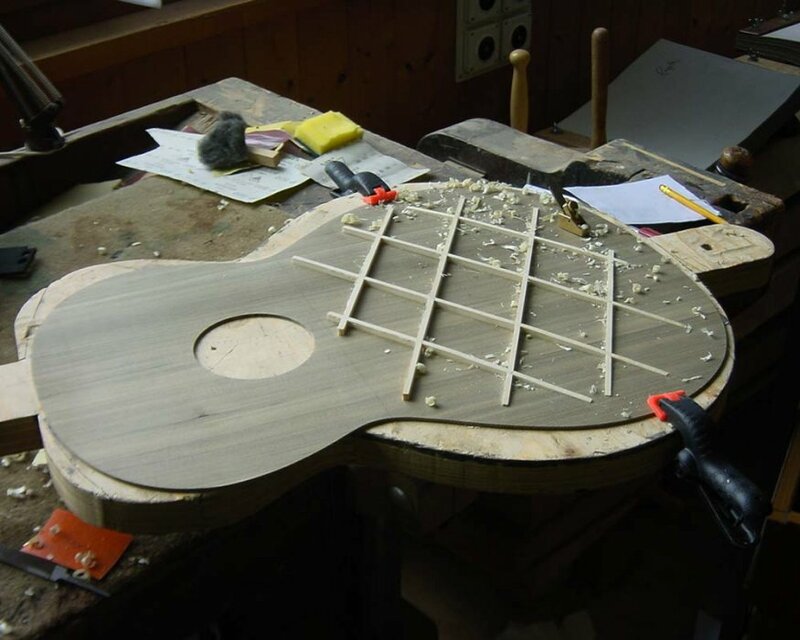 And Vieng’s playing takes it over the top!